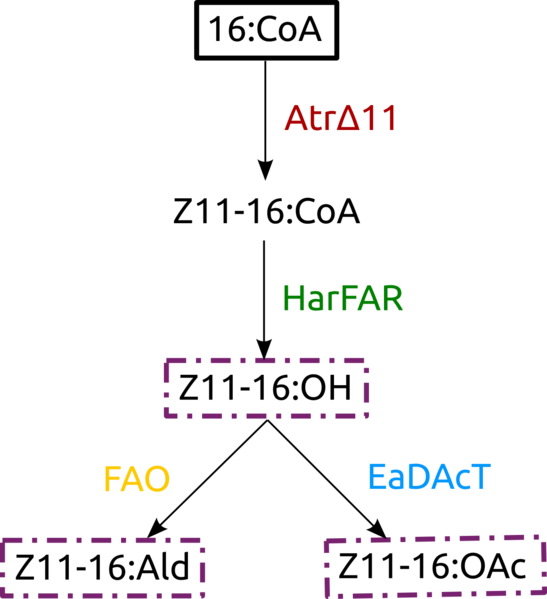 The enzymes involved in the biosynthesis pathways are AtrΔ11, HarFAR, FAO1, EaDAcT. GBlocks designed to be compatible with BioBricks and GoldenBraid (GB). We ordered the following gBlocks and primers. We thought which parts of the GB collection could we use. Grow the selected pieces from the GB collection in liquid medium (performed in laminar air flow cabinet). Culture in agar Petri dish. 2 plaques: Amp and Kan.
Minipreps with EZNA Plasmid DNA MiniKit I. We got the expected bands in all cases. AtrΔ11 amplification by PCR with primers that contain extra nucleotides to introduce them in the sequence. PCR parameters: The annealing temperature was 60°C and the extension temperature was 65°C. 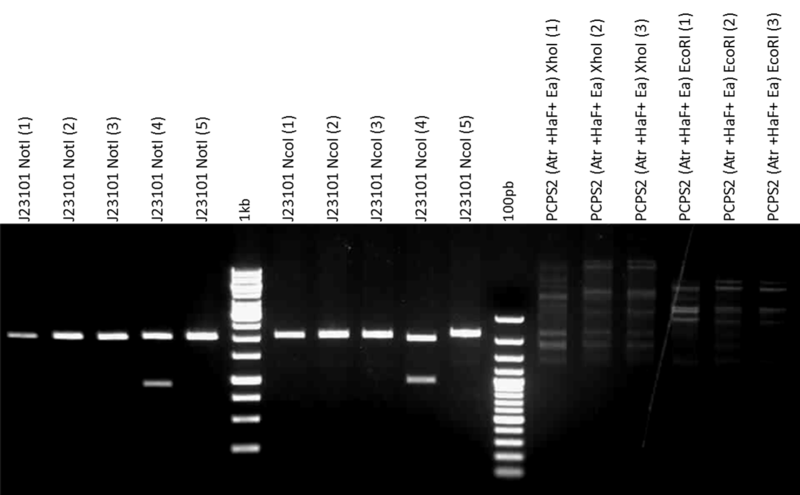 Electrophoresis performed to check the PCR product, which was expected to be around 1 kb. pUPD ligation of EaDAcT, HarFar and AtrΔ11. Termocycler parameters: The ligase temperature was 16°C and the BsmBI temperature was 37°C. As a result, there are obtained three different pUPD plasmids containing the genes EaDAcT, HarFAR and AtrΔ11. E. coli transformation. This step is performed in a laminar air flow cabinet (LAF). We have used an electrocompetent E. coli strain (DH5α) and a sample from each product of ligation made in the previous step (three pUPD plasmids, each of them containing one of the three genes), so transformation is made three times. Each mix is introduced in a electroporation vial and electroporated at 1500 V, then 300 μL of SOC are added to each vial. All of them were incubated at 37°C for 1 hour. After incubation, culture in Petri plates (always in a LAF). 2 cell-culture dishes per transformation (with Ampicillin), one with 50 μL and the other with the remaining volume. Petri plates are incubated at 37°C for 16 h.
All tubes are incubated at 37°C overnight in agitation. Digestions in silico using Vector NTI to check after minipreps if ligations are correct. Perform electrophoresis to check if the size of the fragments from the digestions is correct. We picked blue colonies instead of white by mistake. We need to pick colonies again but this time make sure we pick white colonies. For the repetition we must find another enzyme instead of BanII as we found out that it doesn't cut very well. We made minipreps of yesterday's culture. Thanks to our "double check" medium we found which colonies were well picked. 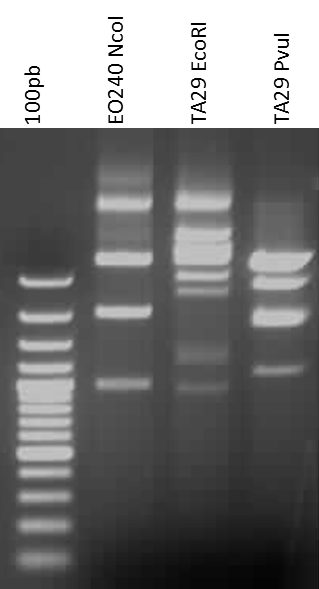 Finally we had minipreps of tubes HarFAR 1, 2, 3; EaDAcT 3 and AtrΔ11 2, 3. Once we had the minipreps, we perform the digestions to check which were correct and send them to sequencing. This time we selected RsaI instead of BanII. The in silico digestions were as follows. We run the electrophoresis gel to check if this time we have done it correctly. Everything was OK. We sent AtrΔ11 (3), HarFAR (3) and EaDAcT (3) to sequence. Now, while we wait for sequencing results, we go on as they were going to be correct in order to save time. The next step is to build a transciptional unit (TU) with our sequences. A transcriptional unit is a structure composed by promoter, coding sequence (CDS) and terminator in an α or Ω vector. Take into account that if we want to make binary constructions later (merge 2 TU in a same vector), we need to clone each TU in a different α vector. We finally got the sequencing results from 07/07/2014. Mutation in AtrΔ11 -> We threw away the colonies and transformed cells. We picked again white colonies. EaDAcT -> Synonim mutation in 601 (A -> T). This is a gBlock! We took vectors 2Ω1 (GB0487) and 2Ω2 (GB0488) parts from the GB colection. Pick colonies and grow them in liquid medium. Grow at 37°C in agitation overnight. We have checked the promoters and terminators are both compatible with GB and BioBricks. Only P35s and T35s work for both. pPnos could also work. Pick 3 colonies of P35s:HarFAR:THsp and PAtUbq:EaDAcT:THsp. Culture in liquid medium with Kan.
We made minipreps of yesterday's liquid culture. Thanks to our "double check" medium we found which colonies were well picked. Finally we had minipreps of tubes AtrΔ11 3 and 6; 2Ω1; 2Ω2; constructions P35s:HarFAR:TatHSP 1, 2, 3 and PAtUbq:EaDAcT:TatHSP 1, 2, 3. Additionally, we have cultured each of the colonies named above to store them. We tested the minipreps made last friday by digestion. Once they were checked, we send the correct ones to sequencing. The in silico digestions were as follows. Everything was OK except the AtrΔ11 (3), which had some partial digestion. It was the reason we sent AtrΔ11 (6) to sequence. We got the sequencing results from yesterday and everything was OK, so we made the transcriptional units ligation. Note: Concentrations were previously adjusted to 75 ng/μL. Only the AtrΔ11 was adjusted from 250.2 ng/μL. 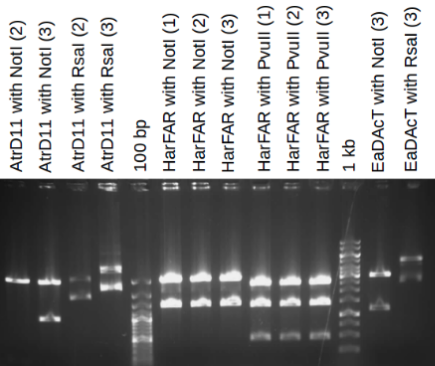 Storage in glycerol of the HarFAR (GB1018), AtrΔ11 (GB1019), EaDAcT (GB1020), P35s:HarFAR:TatHSP in 2α2 (GB1021) and PAtUbq:EaDAcT:TatHSP in 2α2 (GB1022). We made 3 tubes: one for us, one for the GB collenction and one for reserve. The procedure is to mix 700 μL of culture with 300 μL of glycerol 50%, spin it and store it in the -80°C. Pick 3 colonies of P35s:AtrΔ11:T35s, P35s:HarFAR:T35s and P35s:EaDAcT:T35s. Culture in liquid medium with Kan. Preparation of reagents needed for genomic extraction of Candida tropicalis for FAO1. Mistake in P35s:AtrΔ11:T35s, P35s:HarFAR:T35s and P35s:EaDAcT:T35s minipreps. Repeat tomorrow. Minipreps of P35s:AtrΔ11:T35s, P35s:HarFAR:T35s and P35s:EaDAcT:T35s. Concentration measuments with nanodrop. 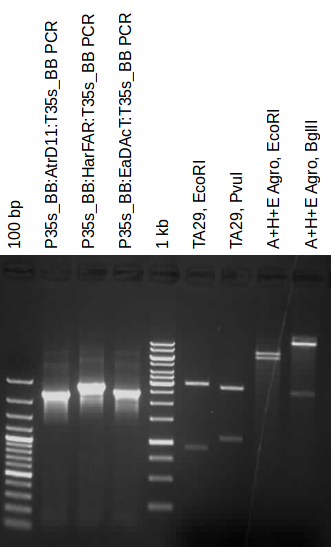 Digestions of P35s:AtrΔ11:T35s, P35s:HarFAR:T35s and P35s:EaDAcT:T35s and gel electrophoresis to check if transciptional units have been assembled OK.
All digestions were correct except P35s:EaDAcT:T35s (2). Set the reaction: 25 cycles x (37°C 2 min, 16°C 5 min). Omega vectors include a resistance to spectinomycin. Transform and grow in Petri dishes yesterday's ligations: P35S:AtrΔ11:T35S + P35S:HarFAR:T35S in 2Ω1 and P35S:EaDAcT:T35S in 2Ω2. Pick colonies of P35S:AtrΔ11:T35S + P35S:HarFAR:T35S in 2Ω1 (3) and P35S:EaDAcT:T35S in 2Ω2 (2). Note: Trichome promoter digestion preparation included. All digestions were correct except the transcriptional unit of EaDAcT in 2Ω2 (P35s:EaDAcT:T35S). All of the pieces named above were adjusted at 75 ng/μL. As the digestions of the transcriptional unit (TU) of EaDAcT were incorrect, we repeated the process from the ligation step. We transformed the same TU in a E. coli competent strain (DH5α). Then, the transformants were cultured in LB media and Spm and stored at 37°C overnight. Finally, in order to obtain the FAO1 gene, we want to extract the Candida tropicalis genome, so we have picked a colony of C. tropicalis. To check the extraction protocol, we used a yeast previously tested, Saccharomyces cerevisiae. We have cultured C. tropicalis in YPD media and S. cerevisiae in YPDA media at 28 °C (5 mL). Saccharomyces cerevisiae is used as a control in order to see if we followed the protocol correctly. We aren't really sure if this protocol is going to work in Candida. S. cerevisiae is recultured with new media (1:2) because the previous media was saturated. 2.25 mL of YPD media were mixed with 2.25 mL of S. cerevisiae culture. The mix has to grow at 28 °C until the exponential phase is reached. Grow yeast in 2 or 5 mL YPD to exponential phase. Collect cells in 1.5 mL eppendorf-cup (centrifugation 20 s, 6000 rpm). Wash once with 1 mL sterile water. Resuspend cells in 200 μL protoplast-buffer (100 mM Tris-HCl, pH 7.5, 10 mM EDTA, 1000 units Zymolyase/mL, 10 μL beta-mercaptoethanol/mL; prepare freshly!). Incubate at 37°C for 1-2 h and finally resuspend by turning the cups. Add 200 μL of Lysis-Mix (0.2 M NaOH, 1% SDS) an mix carefully (Don't vortex!). Incubate at 65 °C for 20 min and cool inmediately on ice. Add 200 μL of 5 M KAc (pH 5.4) and mix carefully (Don't vortex!) and incubate 15 min on ice. Centrifuge (13,000 rpm, 3 min) and transfer supernatant in a fresh cup. Add 2 μL RNase A (10 mg/mL) and incubate at 37 °C for 30 min. Add 600 μL isopropanol and mix carefully (Don't vortex!). Incubate at room temperature for 5 min ad centrifuge (13,000 rpm, 30 s). Remove the supernatant and wash with 70% ethanol (10 min at room temperature). Centrifuge (13,000 rpm, 30 s) and remove the supernatant. Dry DNA pellet in a speed-vacuum (not longer than 3 min!) and resuspend in 50 μL TE-buffer. Store chromosomal DNA at 4 °C (Don't freeze!). Concentration and quality can be checked in an agarose gel (loading 1/10 of the volume). Electrophoresis made to check the extraction quality was correct. We did not observe genomic from Candida because we used a very diluted sample. We will repeat the gel tomorrow. 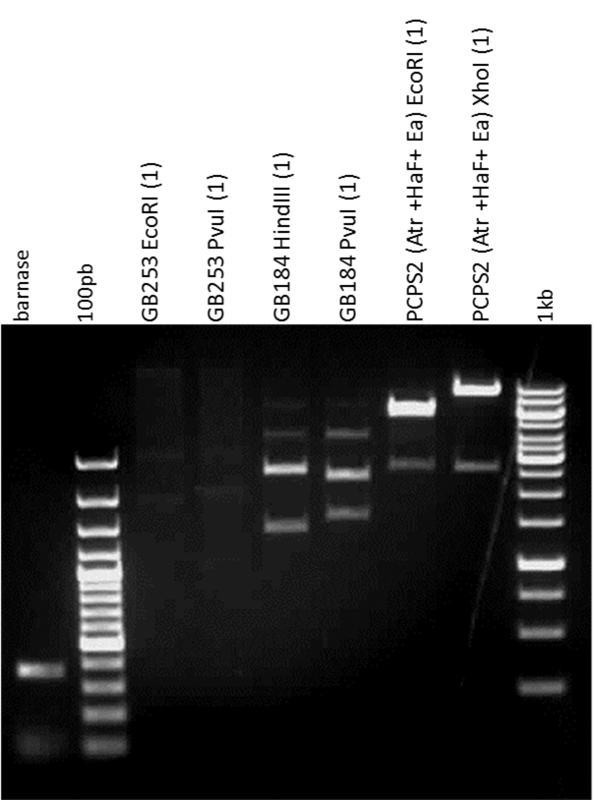 The genomic quality of both organisms (C. tropicalis and S. cerevisiae) was checked in an agarose gel again. We got the Candida genome band, however, the Saccharomyces genome band was not present. Additionally, minipreps of the liquid culture made yesterday were made and also recultured in solid agar plate. Miniprep digestions are going to be done tomorrow. All pieces were correct except the TU corresponding to P35:EaDAcT:T35S. Once the Candida tropicalis genome DNA is obtained, the FAO1 gene can be amplified by PCR. 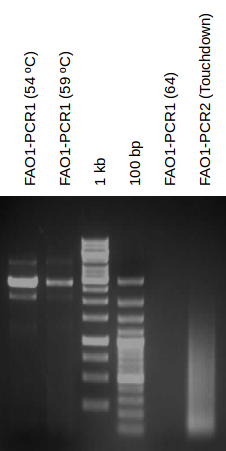 Both FAO1 PCR products were not correct. Annealing 50, 55, 60, 65 ?? We made a mistake preparing the FAO1-PCR1 adding the wrong template, so we do not expect the correct FAO11-PCR1 product. Using an electrocompetent E. coli strain (DH5α) and 1.5 ul ligation (P35s:EaDAcT:T35s in 2Ω2), the mix is electroporated at 1500 V. Then, 300 μL of SOC are added and stored at 37°C with agitation. Transform P35s:AtrΔ11:T35+P35s:HarFAR:T35 and P35s:EaDAcT:T35s (in 2α2) in Agrobacterium tumefaciens strain C58. Introduce 1 μL of construction in a C58 aliquot. Electroporate at 1440V. Add 500 μL of LB in the LAF. Keep 2 hours in agitation at 28°C. Grow 20 μL and 200 μL in solid medium containing kanamicin and rifampicin. Incubate overnight at 28°C. Pick colonies of P35s:EaDAcT:T35s in 2Ω2. Pick colonies from Agrobacterium tumefaciens and grow them in liquid medium for two days at 28°C. Liquid medium is composed by 5 mL LB, Rif (1:1000) and Kan (1:1000) for α vectors and 5 mL LB, Rif (1:1000) and Spm (1:1000) for Ω vectors. Additionally, we recultured in petri dish with its respective antibiotic (Spm). Note: We made master mixes because digestions were made simultaneously with the trichome promoter part. 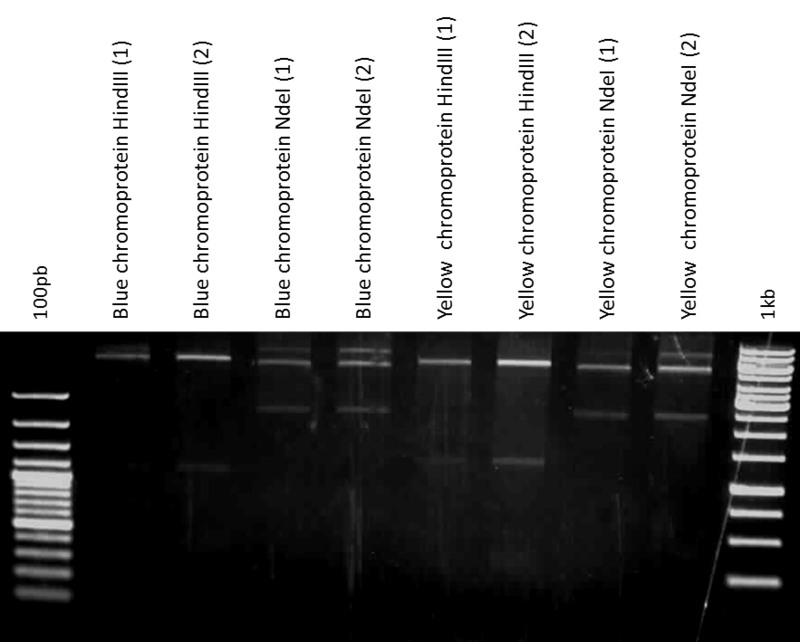 An agarose gel was made to check the transcriptional unit. Minipreps of P35s:EaDAcT:T35s in 2Ω2 (1) went correctly. Ligation of P35s:EaDAcT:T35s in 2Ω2 with P35s:AtrΔ11:T35+P35s:HarFAR:T35 in 2Ω1. Transformation of P35s:EaDAcT:T35s in 2Ω2 P35s:AtrΔ11:T35+P35s:HarFAR:T35 in E. coli. Pick colonies from P35s:AtrΔ11:T35+P35s:HarFAR:T35+P35s:EaDAcT:T35s in 2α1. It is not working yet. For the next time we are going to repeat the dilutions in case they weren't correctly done. FAO1 PCR was repeated (this time using a different primers aliquot). Note: We made master mixes because digestions were made simultaneously with the switch part. We made different mixes for Agrobacterium samples because we think that minipreps are not as good as it is expected. All digestions and TU AtrΔ11+ TU HarFAR + TU EaDAcT in 2α1 were correct. 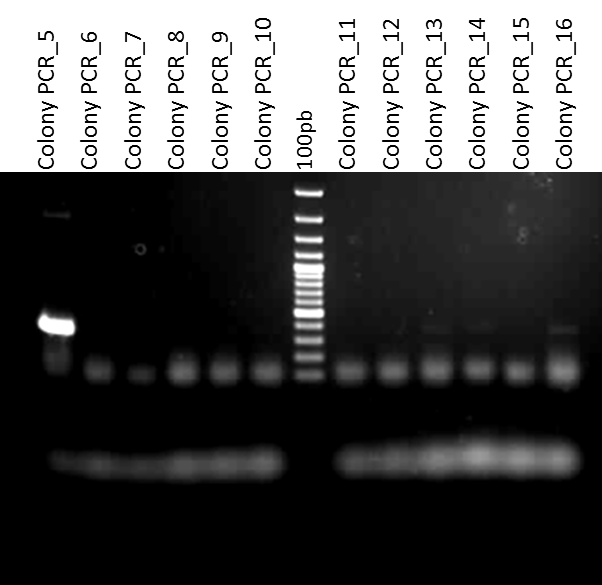 PCR products were not correct or absent again. As digestions were correct, we recultured Agrobacterium in new media (LB) in order to have cultures in exponential phase for tomorrow. We mix in each tube 5 mL of LB with 40 μL of inoculum, XGal (2:1000), IPTG (1:1000)and the corresponding antibiotic (1:1000). Recultured media was grown at 28 °C overnight (around 16 h). Centrifuge the cultures 15 min 3000 rpm and discard supernatant. 5 mL of agroinfiltration solution per culture. 100 mL of agroinfiltration solution were composed of 10 mL MES 100mM (pH 5.6), 1 mL MgCl2 1M and 100 μL acetosyringone solution 200 mM (19.62 mg, DMSO 500 μL; prepare freshly). Mix it with the vortex. If the culture is still turbid, add a bit more of agroinfiltration sollution. Put it in the (rodillos) for two hours. Measure the OD. The optimum OD for agroinfiltration is 0.2. If it is too high adjust the concentration with more agroinfiltration solution. Mix the cultures, keeping all of them in the same proportions. 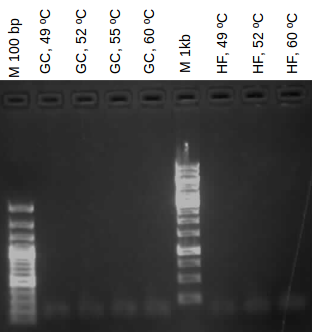 In order to have a control for the FAO1 PCR, which hasn't been very successful, Jesus Munoz provided us with 4 primers and 2 clones of Candida tropicalis (C981 ng/μL and pYEP C98 28.2 ng/μL). These primers amplify for the gene HSR1. 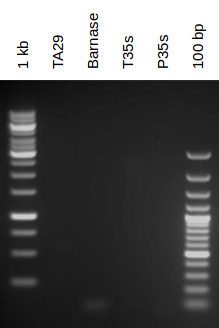 We amplified the genomic of C. tropicalis and the two clones (C98 and C98 pYep)with the primer combinations A and B with Taq polymerase at 2 different temperatures (49 and 52°C). 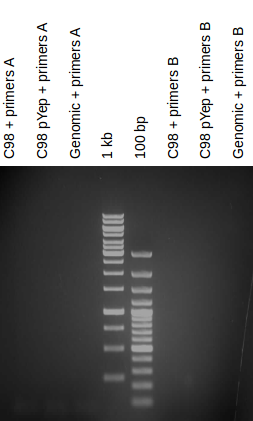 C primer combination was not used due to the length of the spected band. PCR products were not present. It probably did not work because we added to much buffer. We obtained a different plasmid (pUbiquitina HSRI-CDS col.6) as a positive control of PCR to check the quality of our Candida genome. We diluted them to obtain a final concentration of 30 ng/μL. We had amplification in our positive controls. Our C. tropicalis genome may be wrong. Therefore Jesús Muñoz provided us with a new Candida tropicalis (NCYC 2512) culture and also a culture from a Candida tropicales genoteque made in E. coli. Each sample was stored in a vial and kept in liquid nitrogen. Leaves were mashed using a mortar and liquid nitrogen until powder from each leaf is obtained and stored in a vial .Samples must be always kept in liquid nitrogen or in a -80°C freezer . Afterwards the leaf powder was weighted and introduced in a 10 mL screwcap headspace vial. Then 150 μL of EDTA 500mM and 1 mL of a saturated solution of CaCl2 (5,7M) were added to each vial. Stock of solid EDTA Di-Sodium 372,24 Mw and a final solution of 50 mL, 500mM. 372,24*0,5*0,05=9,306 g in 50 mL. After the addition of EDTA and CaCl2 the samples were sonicated dutring 5 minutes to disgregate the tissue and release the volatile compounds. Afterwards the samples were analysed by GC-MC following this procedure. First results of the analysis were obtained. The analysis proved that our plant was successfuly producing the desired pheromones in high concentration. As expected z-11-hexadecen-1-ol and z-11-hexadecen-1-ol acetate were being produced and also unexpectedly the z-11-hexadecenal. 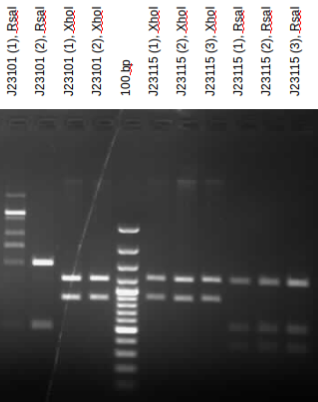 As shown in the figure, the leaf agroinfiltrated with TU AtrΔ11+TU HarFAR and P35s:GFP:P19:Tnos (represented in black) shows a successful production of (Z)-11-hexadecen-1-ol compared with the negative control that only has P35s:GFP:P19:Tnos (represented in blue) and shows no expression. In this figure, expression of (z)-11-hexadecen-1-ol and (z)-11-hexadecen-1-ol acetate is proved. The expression in the leaf infiltrated with TU AtrΔ11+TU HarFAR and TU EaDAcT and P35s:GFP:P19:Tnos is represented in black, and the negative control with P35s:GFP:P19:Tnos is represented in blue. In this figure, an unexprected peak present in the leaf infiltrated with TU AtrΔ11+TU HarFAR and P35s:GFP:P19:Tnos (black) can be observed. Comparing its spectrum with the one provided from the database seems to be (z)-11-hexadecenal, a desired pheromone, which is being produced by the plant itself using an endogenous alcohol oxidase. Nevertheless as it is produced with a low yield, the FAO1 of C. tropicalis search is still in progress. The rest of the samples were prepared for the GC-MS analysis. The samples were weighted, introduced in the vial and added with EDTA and CaCl2. In this replica, the sample with the TU AtrΔ11+TU HarFAR and P35s:GFP:P19:Tnos construction shows a huge production of (z)-11-hexadecen-1-ol. In this replica, the sample with the TU AtrΔ11+TU HarFAR and TU EaDAcT and P35s:GFP:P19:Tnos shows a higher abundance of (z)-11-hexadecen-1-ol and z-11-hexadecen-1-ol acetate. In order to verify that the analysed compounds are the desired pheromones, we acquired standards for (z)-11-hexadecen-1-ol and (z)-11-hexadecen-1-ol acetate and (z)-11-hexadecenal, and indeed, the analysed compunds were the right ones. Our happiness reached a peak!! A PEAK! 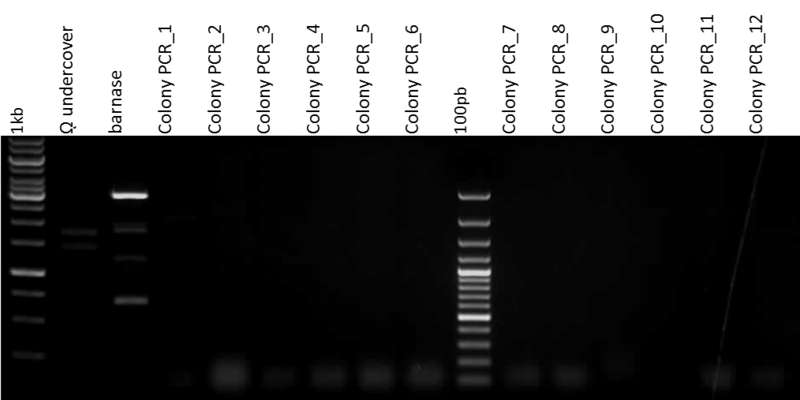 We had problems to amplify the FAO1 gene, so in order to obtain it we performed a colony PCR. Using this method, it is possible to amplify a fragment directly from a colony rather than a DNA sample. 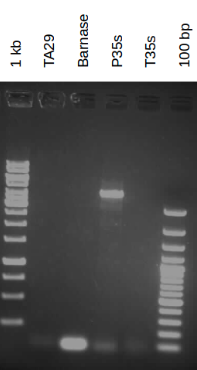 We made two different PCRs, one of them as a positive control and the other one to amplify our disered DNA fragment. Primers used as a control: HSR1 + 480 and RTRv + 1149. Primers used to amplify FAO1 gene: iGEMJUL07_FAO1_1F and iGEMJUL08_FAO1_1R. Starting from an agar plate containing a Candida genomic library, we add 1 mL of LB medium and we mix it. Then, the mix was transferred into a tube. We stored part of the culture in glycerine and another part (200 μL) was mixed with 5 mL of LB media and Amp (2:1000). The tube containing the genomic library was grown at 28°C for 1 hour. Then, we made minipreps. 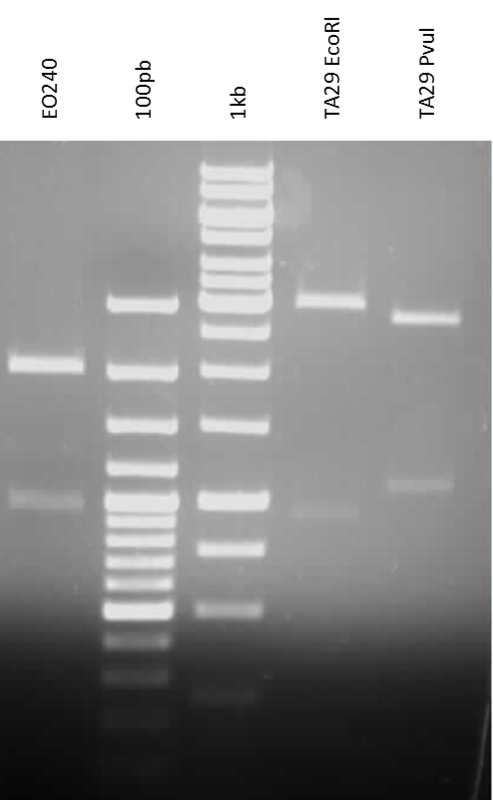 The electrophoresis gel shows that the colony PCR failed, even the control did not work. 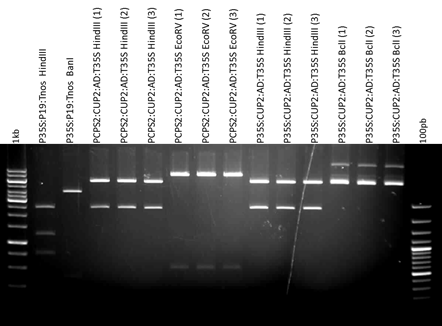 Additionally, we test the BbsI restriction enzyme and we found that it does not cut well. We transformed the whole pathway (P35S:AtrΔ11:T35S, P35S:HarFAR:T35S, P35S:EaDAcT:T35S in 2α1) into Agrobacterium tumefaciens (C58) and we cultured it in solid media with Kan (1:1000) and Rif (1:1000) during 2 days at 28°C. 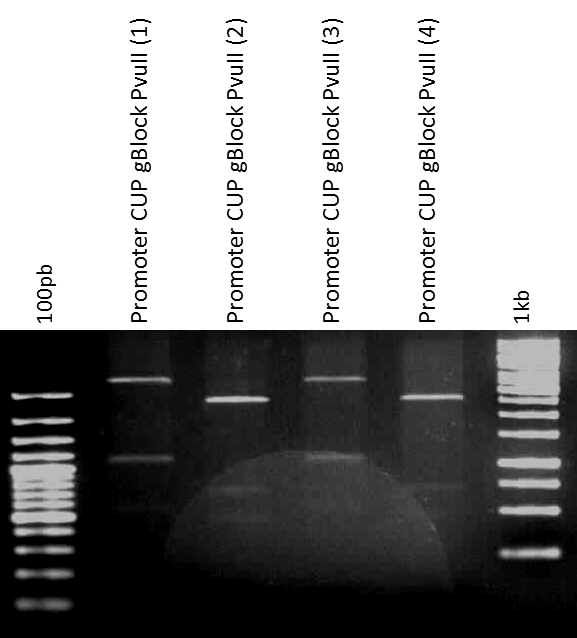 We repeated the colony PCR to obtain FAO1 gene and also control PCRs (using the genomic library minipreps made on 08/14/2014). We were trying to obtain the FAO1 gene. We did a yeast colony PCR. Using an sterile tip, we picked one C. tropicalis colony and we introduced them into a vial containing 30 μL SDS 0.2 %. The vial was vortexed 15 seconds and then heated 4 minutes at 90°C. Next, it was centrifuged during 1 minute ans the supernatant was transferred to a new 1.5 μL vial. That was our PCR template. 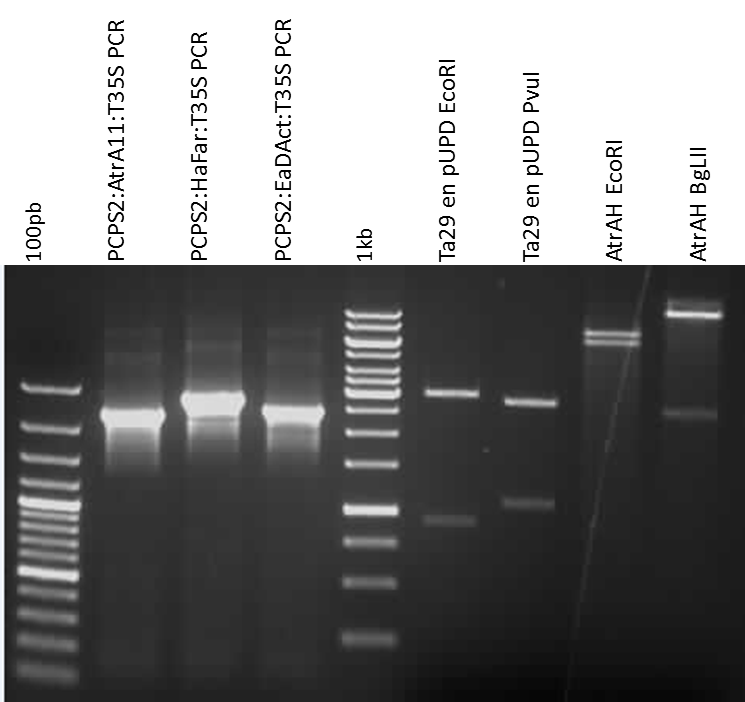 We performed a control PCR employing control primers (HSRI Rtrv + 1149 and HSRI BamHI + 480)and the another PCR using FAO1 primers as previously done (iGEMJul09 and iGEMJul10). 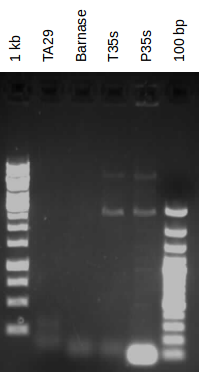 We did not close the PCR tube properly so we found our PCR product evaporated (named as FAO in the gel). 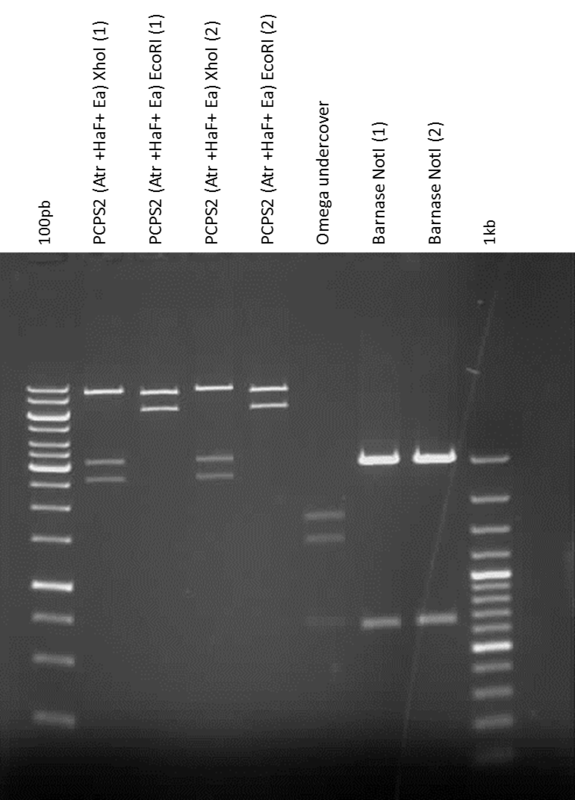 The other PCR product (the control) was loaded and as it is shown in the gel electrophoresis, it didn't work. Pick 8 colonies of C. tropicalis growth in YPD media and resuspend them with 100 μL of solution (200 mM LiOAc and SDS 1%). Incubate 15 min at 70°C. Add 300 μL of ethanol 96%. Then, vortex the solution. Centrifuge 3 min at 15000 xg. Discard the superatant and resuspend the pellet (precipitated DNA) with 100 μL TE. Centrifuge 1 min at 15000 xg. Recover 1 μL of supernatant. 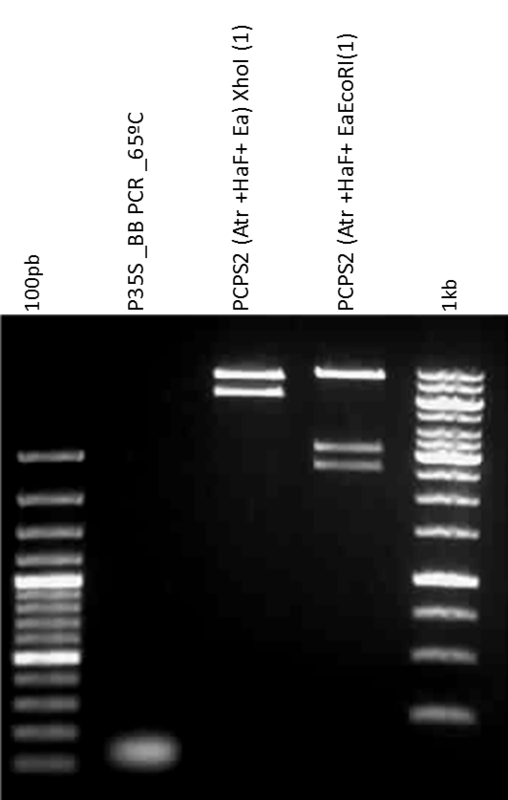 Using this genomic DNA as a template, we run a PCR (using Taq polimerase) with our primers and another one as a control. 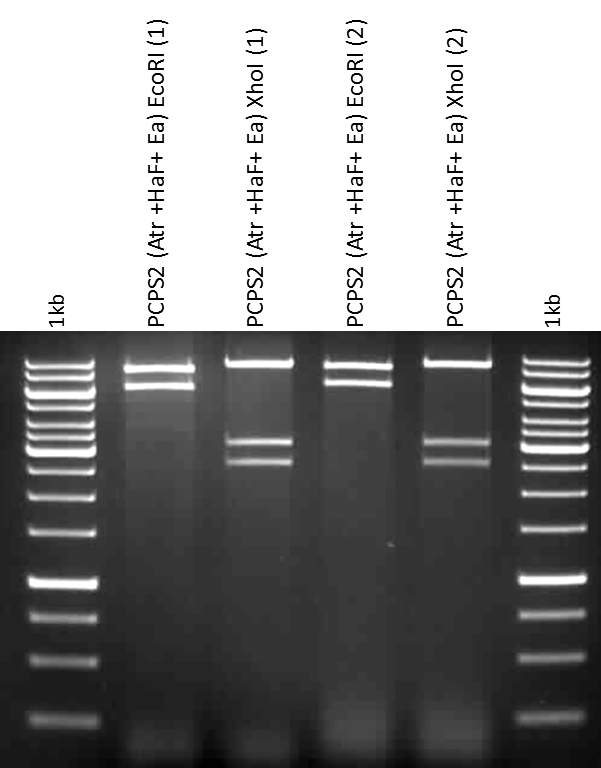 The electrophoresis gel shows that PCRs have not yielded any product. We picked colonies of GB parts and we recultured them in liquid media. We cultured C. tropicalis in liquid media in order to make a genomic extraction to finally obtain FAO1 gene and we made YPD media. 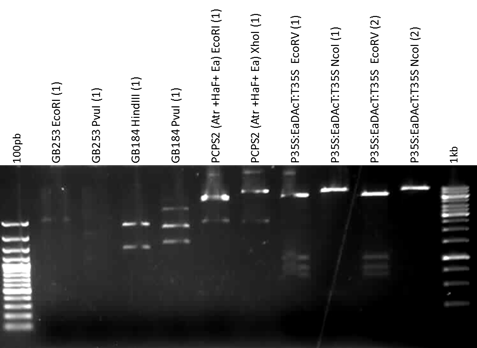 GB parts were correct except GB0160, which has to be repeated since we digest low DNA concentration. 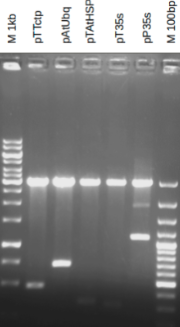 We repeated again a genomic extraction (C. tropicalis) following the same protocols. We picked colonies and recultured them in liquid media in order to preservate them with glycerol. We repeated GB0160 digestions and we found that the piece is correct. We observed agroinfiltered leaves and we took samples of them. We stored liquid media cultured on 08/28/2014 in glycerol. We stored in glycerol at -80°C cultures grown yesterday. Add 300 μL glycerol (50%) and 700 μL of liquid culture. We did minipreps again to check our strikes, since we suspect that we have contamination in SF_P35S:EaDAcT:T35(2Ω2) agar plates and we want to store it in glycerol correctly. We did not obtain the expected bands, we will try again picking another colony. They were not correct. We will keep trying. Cultures were grown at 28°C during 2 days. To store our construction SF_P35S:EaDAcT:T35S in 2Ω2 in glycerol, we picked some colonies and cultured them in liquid media. We repeated the miniprep again to be sure that we are storing it correctly. We picked colonies once again to store the cultures in glycerol, since we did a mistake and minipreps were thrown away. The protocol followed was the same as usually, but this time using a vacuum pump and a desiccator instead of a syringe. We recultured A. tumefacies with P35S:AtrΔ11:T35S_P35S:HarFAR:T35S_SF_P35S:EaDAcT:T35S in new liquid media. We collected agroinfiltered N. benthamiana leaf samples. They did not present necrosis as the previous time, but chlorosis was seen in both agorinfiltered plants. Samples were freezed with liquid nitrogen and grinded. Then, there were stored at -80°C. Some of the samples were analyzed by CEQA. We picked A. tumefaciens colonies containing the TU to agroinfilter. 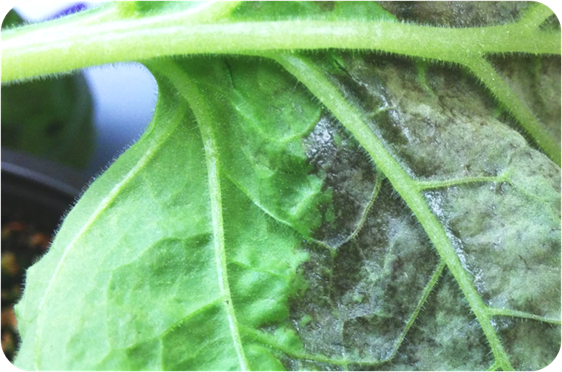 We refreshed A. tumefaciens cultures to agroinfilter N. benthamiana leaves. Additionally, we recultured the same cultures and grown them at 28°C. We performed an EAG. Antennae responded to the pheromone. We test the extracts with moths, but unfortunatelly the insects were not active, so they did not react to any stimulus. We analysed our plants using the method called Volatile Organic Compounds (VOCs). We coleected agroinfiltred samples from the previou days following the protocol. We collected agroinfiltred leaf samples. We repeated the EAG with other Sesamia individuals. We saw a peak corresponding to the alcohol pheromone (Z11-16:OH) and the acetate pheromone (Z11-16:OAc). 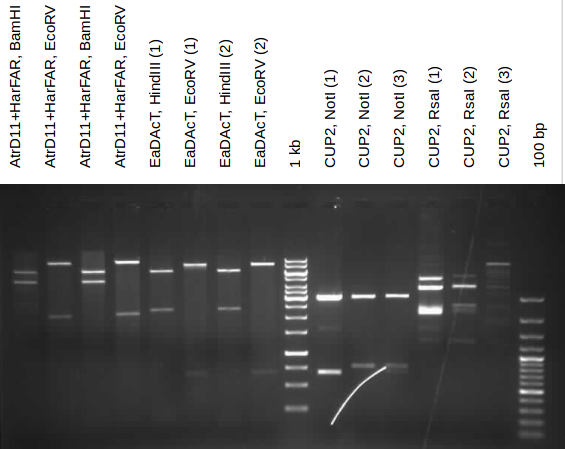 Genomic DNA extraction from Nicotiana tabacum. We need the genome of this organism because we want to obtain the trichome promoter from the NtCPS2 gene. Obtain 100 mg of the tobacco leaves (5 disks made with a 1.5 mL vial). Made it twice. Introduce the disks inside the tube. Introduce the two tubes in liquid nitrogen. Remove them from the liquid nitrogen and store at -80°C until use. Remove one tube from -80°C and re-introduce them in liquid nitrogen. 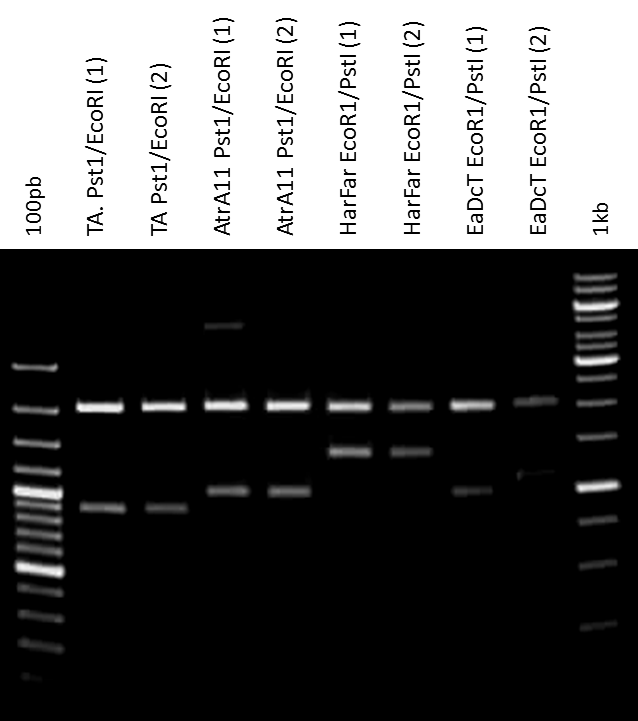 Add RNAse (1.6 μL at M = 100 ug/μL for each mL of CTAB buffer). Vortex it and maintain at 65°C for 45 min. Mix it by inversion 5-15 min. Add 600 μL cloroform:isoamilic alcohol. Vortex it. Centrifuge 15 min at 13000 rpm (or 10 min at 14500 rpm. Recover the supernatant by aspiration (with a 200 μL pipet). Repeat the last three steps. Add one volume o isopropanol and mix well by inversion (10 times). To precipitate, maintain 20 min on ice or at -80°C during 5 min. Centrifuge 10 min at 13000 rpm (4°C). Discard the supernatant by decantation (be carefull with the pellet). Wash with 600 μL ethanol (80%). Centrifuge 5 min at 13000 rpm. Discard the ethanol by pipeting and let it dry a few minutes. Resuspend it in 50-100 μL H2O miliQ or with TE buffer. Measurement of genomic concentration with nanodrop. Electrophoresis performed to check the genomic size of tobacco (to see if it is degradated). 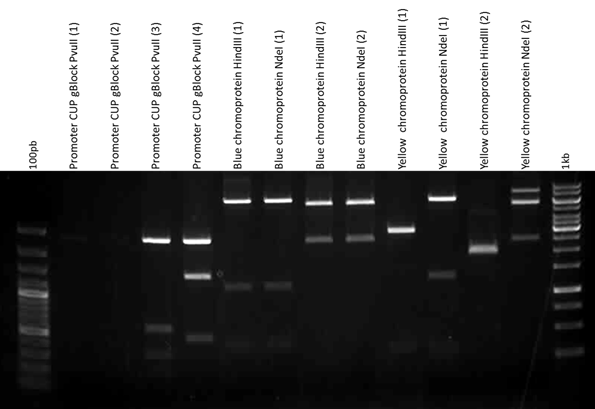 PCR of genomic extraction of tobacco in order to amplify the trichome promoter CPS2. Use a 1:10 alicuot for PCR (10 uM). We didn't get PCR product. 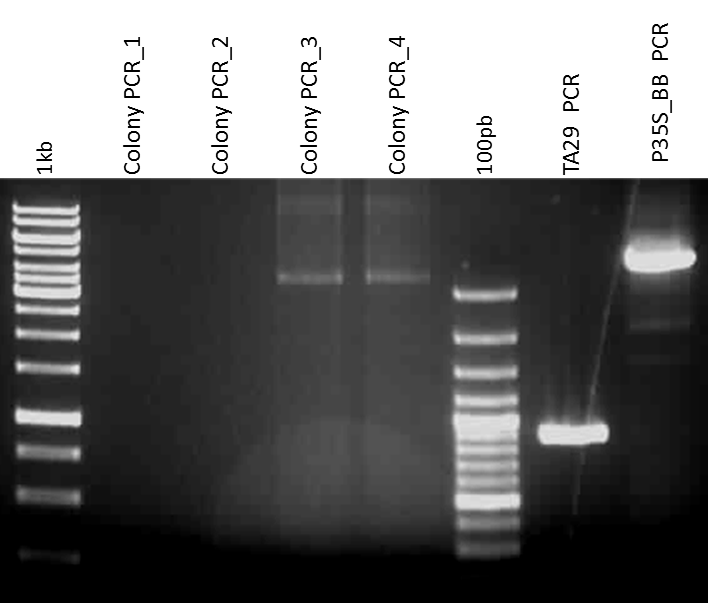 Repeat PCR with different parameters. 1, 2 and 5 contain buffer F; 3 and 4 contain buffer GC. 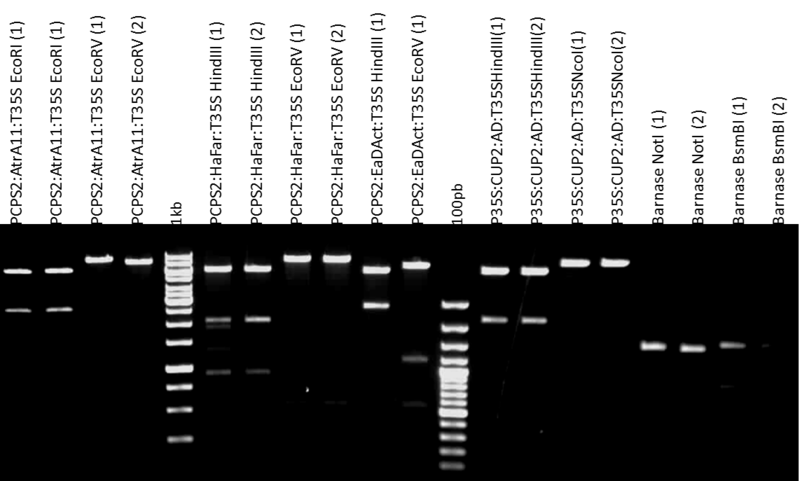 Repeat PCR again with other parameters. Set 4 tubes with each buffer at different temperatures: 49, 52, 55, 60. Repeat PCR again with more genomic. Same parameters as before except annealing temperatures which are: 50, 53, 57, 59 °C. We still without having any amplification. Repeat the PCR with other enzyme. 12.5 μL Q5 Master mix (2x). Set 4 reactions at 50, 53, 55, 59 °C. The DNA fragment of interest is around 1.5 kb so we see we finally obtained amplification at 55 and 59 °C reactions. 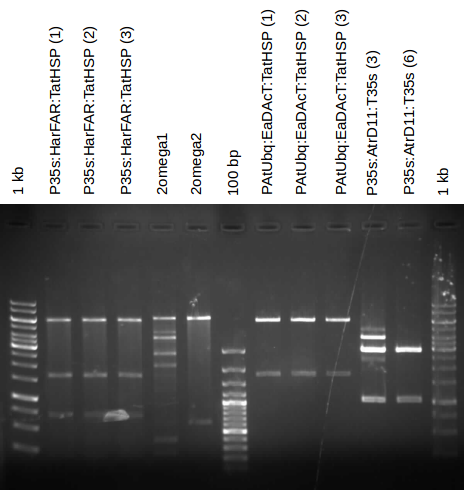 Trichome promoter PCR product ligation in pUPD. Transform and grow in Petri dishes yesterday's ligation of the trichome promoter in pUPD. We picked colonies of the trichome promoter in pUPD and grown it in liquid culture. We made minipreps of yesterday's liquid culture. Additionally, we have recultured them in solid growth media. Both minipreps were adjusted to 75 ng/μL. Note: To see further details of digestion master mixes, go to the biosynthesis part, date 07/22/2014. Yesterday's digestions were correct, so the trichome promoter in pUPD was send to sequencing. We picked colonies from pTnos, pGFP and pLuciferase. Minipreps of pTnos, pGFP and pLuciferase. See master mix and gel digestion in Biosynthesis part. Pieces were obtained correctly and adjusted to 75 ng/μL. Trichome Promoter transformation in E. coli. Using an electrocompetent E. coli strain (DH5α) and 1.5 ul ligation (CPS2:GFP:TNos in 2α2), the mix is electroporated at 1500 V. Then, 300 μL of SOC are added and stored at 37 °C with agitation. Pick colonies of CPS2:GFP:TNos in 2α2. Additionally, we recultured in petri dish with its respective antibiotic (Kan). Note: We made master mixes because digestions were made simultaneously with the biosynthesis part. Minipreps of CPS2:GFP:TNos in 2α2 (1) went correctly. Transcriptional Unit (TU) PCPS2:GFP:TNos in 2α2 was transformed in Agrobacterium tumefaciens (C58) and cultured in liquid media with Kan and Rif at 1:1000 (2 days at 28°C). Note: The scientific name has been updated to Rhizobium radiobacter. The TU (PCPS2:GFP:TNos) was recultured in liquid media. Additionally, P35S:GFP:p19:TNos TU was recultured in liquid media, using Spm and Rif as antibiotics. Agrobacterium cultures were refreshed in new liquid media. Additionally, we cultured them in solid media. Minipreps of the TU PCPS2:GFP:TNos in Agrobacterium were made. and digestions were performed to check they were correct. PCPS2:GFP:TNos (1) digestion was correct. A part containing P35S:P19:TNos construction was taken from the GoldenBraid collection (GB108) and cultured in solid media with Kanamycin 50 mg/mL. This part is not going to be used as a control but as a silencing supressor. One clony (P35S:P19:TNos) was recultured in liquid media. Minipreps and streaks of yesterday's culture were made. The piece was checked by running a gel containing the digested fragment. The GB108 piece (P35S:P19:TNos) is digested as expected in silico. We transformed the piece (P35S:P19:T35S) into Agrobacterium tumefaciens (C58) and we cultured it in solid media with Kan (1:1000) and Rif (1:1000) at 28°C during 2 days. Agrobacterium containing the piece has not growm well, so we transformed the piece again and we cultured it in an agar plate following the same protocol as previously. In the mean time, we made agar plates. We made ligations of the three enzymes that form the (Z)11-16:OAc (Z11-hexadecenyl acetate) pheromone but this time each TU will contain the trichome promoter. Note: For further information about the PCPS2 promoter, please check the trichome promoter section. TU containing the trichome promoter were transformed into E. coli. Agrobacterium has not grown in agarose plates, so we made a transformation again. 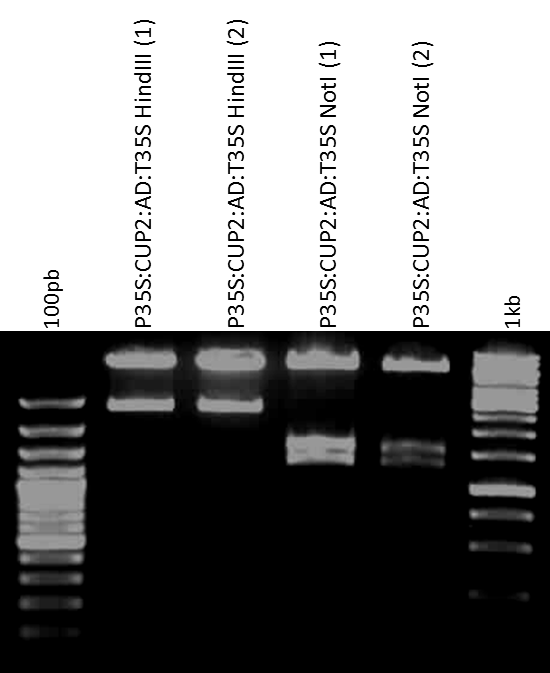 Digestions were correct, but the PCPS2:HarFAR:T35S digestion 1 with HindIII resulted in more bands than expected, so we discarded that miniprep product and we used the other one. We adjusted checked products to 75 ng/μL in order to use them in ligations. Reaction conditions: 25 cycles x (37°C 2 min, 16°C 5 min). Then, we recultured E. coli in solid media. TUs ligated previously were transformed in E. coli following the same protocol as it is usually used. Finally, we obtained the control (Z)11-16Hexadecenl Acetate that will be used to check the peack in the GC-MS analysis. Agrobacterium cells containing P35S:P19:TNos did not grow, so we ask Marta for the glycerinated Agrobacterium culture. The vector containing the TU was pGreen and we cultured them with Tetracycline, Rifampicin and Kanamycin. We have confirmed our peak because the control sample has the same retention time and distribution pattern. Additionally, we have recultured in liquid media TUs ligated yesterday. All digestions were not correct. We made minipreps of Agrobacterium culture: P35S:AtrΔ11:T35S_P35S:HarFAR:T35S_P35S:EaDAcT:T35S in 2α1. We picked colonies which were transformed yesterday and we recultured them in liquid media with Spm, IPTG and X-Gal. Finally, we have trasplanted N. benthamiana into new flowerpots to have plants ready to infiltrate in the future. We made minipreps of yesterday's culture, but only for the TU PCPS2:AtrΔ11:T35S_PCPS2:HarFAR:T35S in 2Ω1 since the other tubes were blue colored. We transformed into E. coli the previous ligations. We picked colonies of yesterday's agar plates containing the transformants and we recutured them in liquid media with Spm (1:1000). PCPS2:AtrΔ11:T35S_PCPS2:HarFAR:T35S was correct and PCPS2:EaDAcT:T35S tubes 1 and 3 were also correct. We picked PCPS2 in pUPD colonies and recultured them in liquid media in order to preservate them with glycerol. Protocol followed was the same as previously done. We transformed into E. coli the previous ligation and we recultured cells in an agar plate. On the other hand, we observed the leaves agroinfiltred this week and we took pictures showing that the trichome promoter works. We obtained trichome selective expression of GFP! We stored PCPS2 in pUPD liquid media with glycerol. We made minipreps of PCPS2:AtrΔ11:T35S_PCPS2:HarFAR:T35S:SF_P35S:EaDAcT:T35S liquid media. Digestions were not correct, we have to repeat the ligation. We repeated it following the same protocol. We collected agroinfiltrated samples and we prepared them to the analysis following the same protocol as we did the last time. Additionally, we picked colonies and recultured them in liquid media in order to store them in glicerol. Mix it well using vortex. We transformed into E. coli ligation made yesterday and we cultured cells in agar plates. Ligation was repeated since we did not found any white colony in the agar plates. Ligation Conditions were the same as we did previously. We transformed it in E. coli and we recultured the cells in agar plates. We followed the same protocol again. 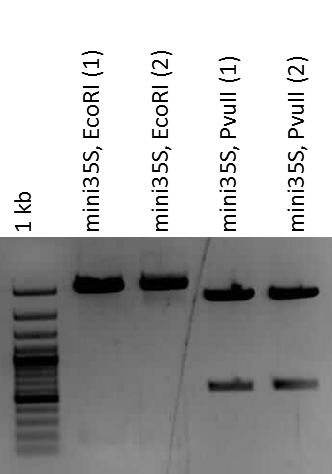 All digestions were correct except digestions from one miniprep (SF_PCPS2:EaDAcT:T35S). We had two replicates and only one of them was incorrect, so we could refresh the cultures with liquid media in order to follow the agroinfiltration protocol. We picked colonies of colonies transformated yesterday with TU AtrΔ11 + TU HarFar + TU EaDAcT. Samples were checked by GC-MS and we found low pheromone signal. I may be due to agroinfiltered leaves showed necrosis. We have to repeat the experiment to confirm that our construction is not well tolerated by plants. 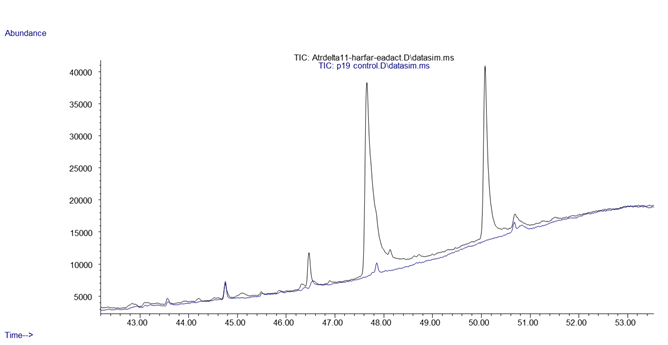 Additionally, we found that the alcohol precursor did not appear in the chromatogram. Nevertheless, the acetate product was present in higher quantities than the previous time, suggesting that higher yields can be obtained when the three gens are placed in the same construction. Colonies picked yesterday were not correct since resulting cultures were blue. We repeated the ligation, but this time we added 1 μL of BsaI enzyme after the inactivation step. It was incubated at 37°C during 1 hour. Then we transformed the ligation and cultured it in agar plates. We picked colonies of yesterday's agar plates in order to do minipreps. We trasformed the previous plasmid to A. tumefaciens following the same protocol as usually. They were grinded up with liquid nitrogen and then stored at -80°C. We are going to do the miniprep again to be sure that we are storing it correctly. We picked colonies of A. tumefaciens containing the pheromone pathway with trichome promoter (PCPS2:AtrΔ11:T35S_PCPS2:HarFAR:T35S_SF_P35S:EaDAcT:T35S). We prepared samples to inject them in GC-MS following the same protocol as previously carried out, that is to say, grinding samples with liquid nitrogen, adding saturated CaCl2 and EDTA and sonicating. We recultured in liquid media A. tumefaciens with PCPS2:AtrΔ11:T35S_PCPS2:HarFAR:T35S_SF_PCPS2:EaDAcT:T35S. Digestions that were still pending from 09/12. Digestions were not correct, so we picked again to repeat minipreps. Digestions in silico were the same as previouly done. 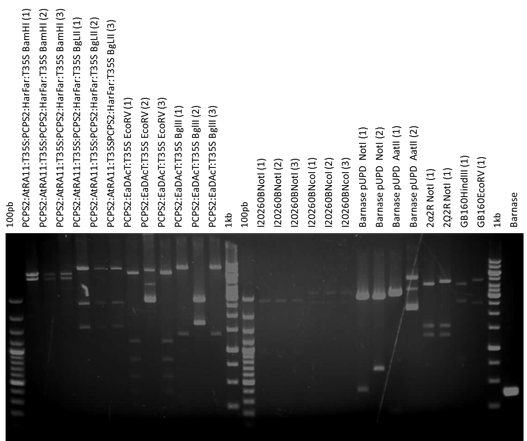 We did not obtined the expected bands in case of the pathway regulated by the PCPS2 promoter. We repeated again the ligation in 2α1 employing the same conditions. Then, we inactivated the enzyme by incubation at 80°C uring 30 min. After that, we added BsaI in order to prevent the growth of blue colonies in the agar plates. In parallel, we used the miniprep to transform the construction into E. coli. We recultured A. tumefaciens cutures to agroinfiltrate. We picked colonies of transformants containing the pathway with the trichome promoter and they seem correct since they are white. We have transformed on E. coli ligation made yesterday. Following the same protocol as usually, we agroinfiltered N. benthamiana leaves. We obtained a peak corresponding to the ester compound (Z11-16:OAc.) when the P35S:AtrΔ11:T35S_P35S:HarFAR:T35S_SF_P35S:EaDAcT:T35S construct was expressed in the leaf. We also obtained a big peak of the alcohol (Z11-16:OH). We were told by our advisor that Rosea produces necrosis in N. benthamiana, so we must think of an alternative. We picked colonies from P35S:Rosea:TNos and TA29:Barnase:TNos. Minipreps of P35S:Rosea:TNos and TA29:Barnase:TNos. We talked with the NRP-UEA-Norwich team. We stablished a possible collaboration in developing the biosafety module together. They could send us their chromoproteins and we could send them our barnase and TA29 promoter. Primers received. 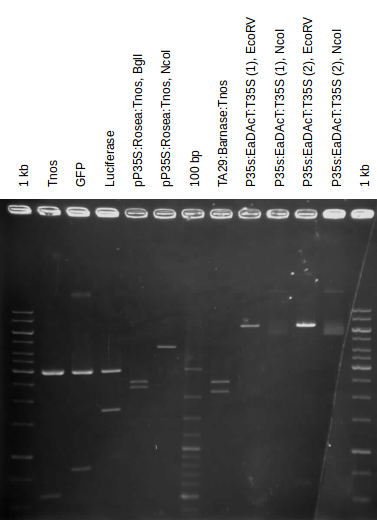 PCR for barnase and TA29 performed. We didn't obtain PCR product. There is a band for the barnase, but it should be around 330 bp. We repeat yesterday's PCR with 2 degrees less in the annealing step. Results obtained are the same of yesterday's. We should think about charging something else. 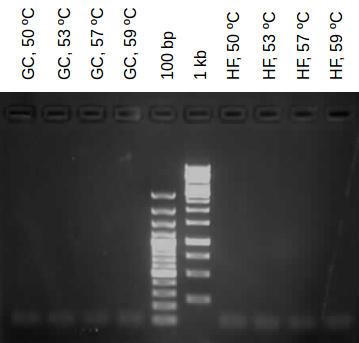 The previous PCR was repeated changing the annealing temperature to 61°C. We still do not get PCR product. We forgot to adjust the TA29:Barnase:Tnos from GB 1.0 to 5 ng/μL. Maybe that's why PCRs don't work. We repeated again with the appropiate temperatures (60°C for TA29 and 63°C for barnase), but it still doesn't work! We transformed in E. coli the iGEM Barnase part (BBa_1716211), placed in Plate 3, 11o. 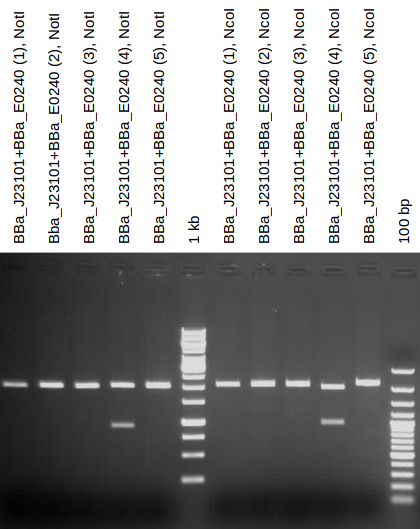 A PCR using Nicotiana tobacum genome as a template was made to obtain the Ta29 fragment. 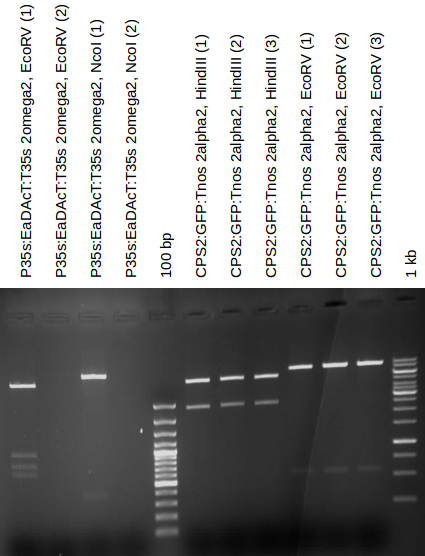 Primers used and also PCR conditions were the same as previous PCRs. E. coli colonies containing the iGEM Barnase part (BBa_I716.211) were recultured in liquid media. 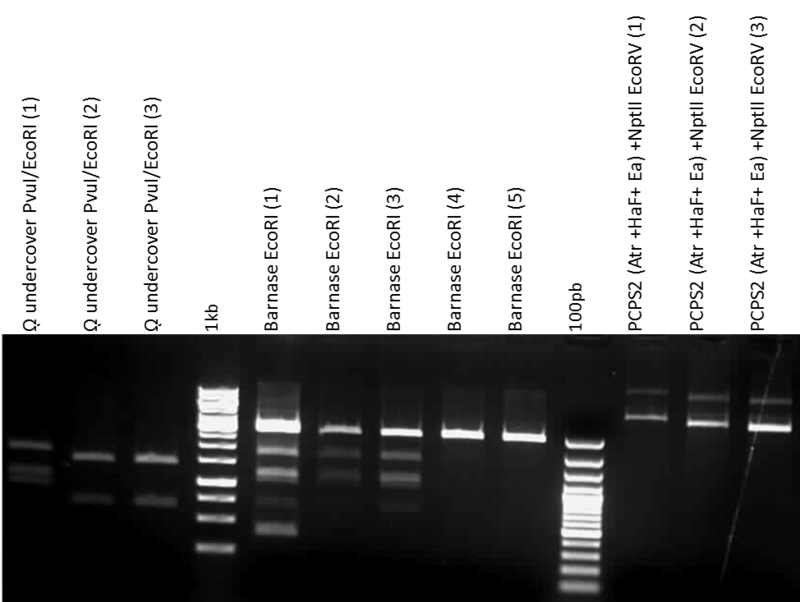 Digestions were correct, so we adjusted the product to 5 ng/μL in order to use them as a PCR template. We made a mistake predicting digetions in silico, so we repeated them, this time with the appropriate vector (pSB1C3). 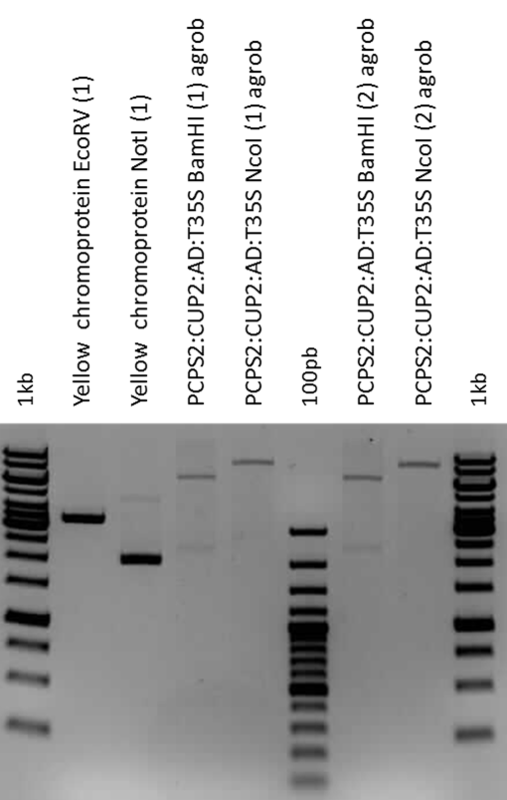 This double digestion was checked with an agarose gel showing that the resulting bands were the expected ones. Additionally, TA29 in pUPD vector was transformed in E. coli. The protocol followed was the same as previously done. 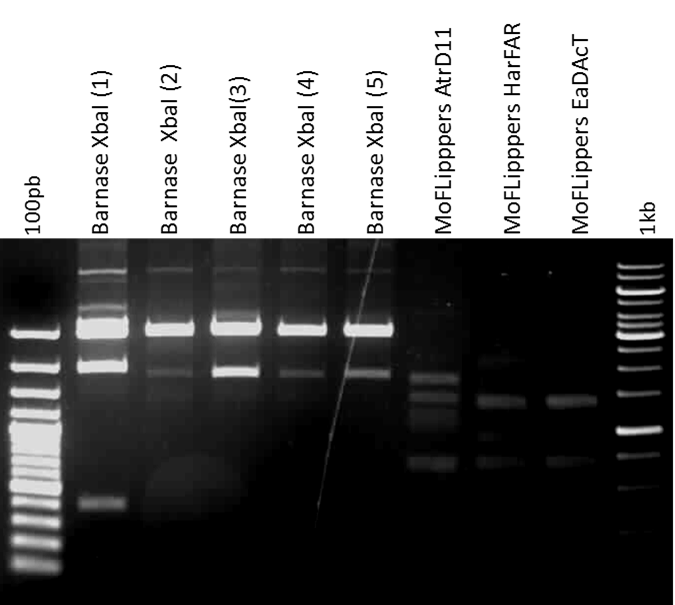 We did a PCR to obtain the Barnase as a product using the primers Bar_F1 and Bar_R1 and the template obtained yesterday. 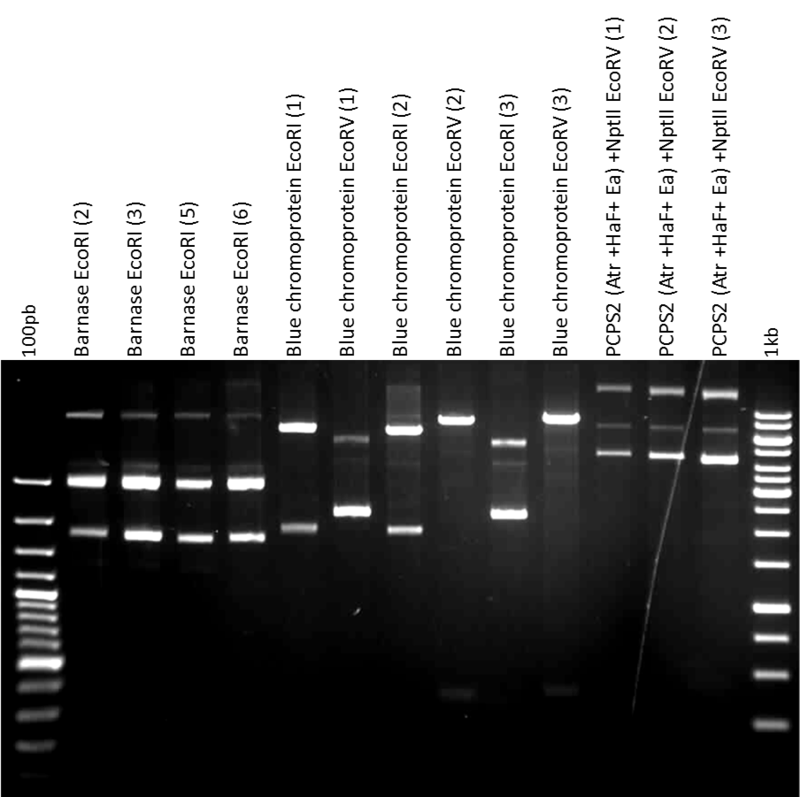 The agarose gel shows that the PCR product was correct, but we purified the band to get a better quality product using a QUIAGEN purification kit (QIAEXII Gel Extraction Kit 150, Cat. No: 20021). We recultured in liquid media yesterday's TA29 culture. We made minipreps of yesterday's culture. Digestions were not correct. We picked again TA29 in pUPD colonies and recultured them in liquid media. We made minipreps of TA29 culture. In silico digestions made to check yesterday's minipreps. Resulting bands were as expected in silico, the piece is correct. Ligation conditions were the same as previous ligations. Then, we transformed it into E. coli and we cultured them in agar plates with Amp. We recultured TA29 piece in liquid media with Kan.
We repeated these digestions because our water tube was contaminated. We picked some colonies of yesterday's agar plates containing cells with Barnase in pUPD. Yesterday's cultures were blue, but we made minipreps and checked them with digestions. Barnase digestion number 1 was correct. We send the resulting miniprep product to sequencing. We picked E. coli colonies containing Barnase in pUPD again since we have a point mutation in the previous sequence. Mutation seems to be in the primer, but we are going to try another colony. 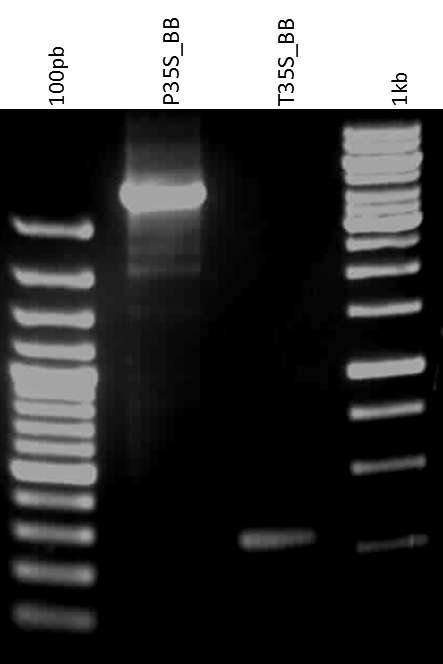 We made digestions using the same restriction enzymes as previously used. Digestions were not correct. We have to repeat again the protocol, so we picked more Barnase in pUPD colonies. 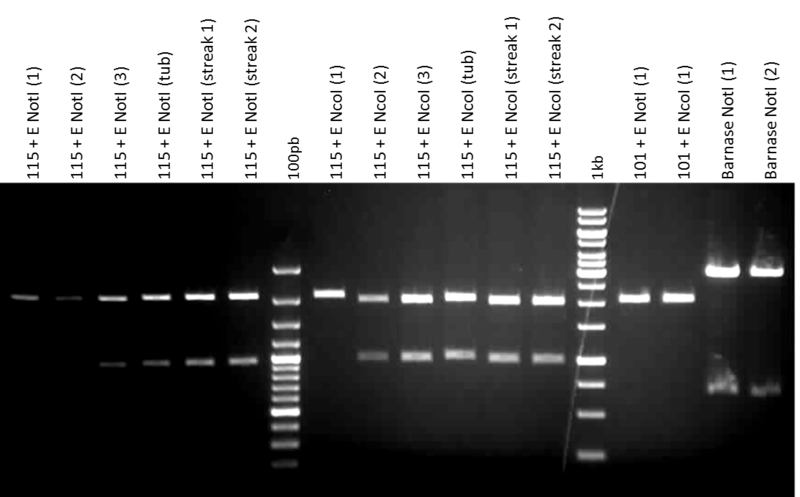 We made a screening PCR as a fast way to screen Barnase colonies. Both positive and negative control were correct. Additionally, we have barnase in wells 1, 2, 3, 4, 5, 7, 8 and 9. Wells 6 and 10 were not correct. Barnase in pUPD. We made minipreps and digestioins to check them. bands were not correct, so we picked another colony. We did minipreps of barnase's culture. Digestions were not correct. We picked more colonies, tomorrow we have to do minipreps again. We did again Barnase minipreps. All digestions were not correct except one of them. 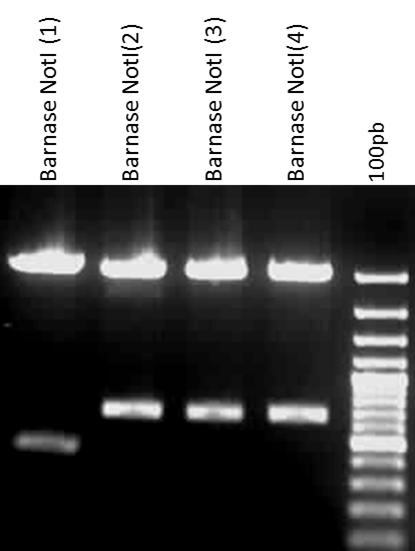 We repeated a Barnase PCR using the primers Ago03 and Ago04. Annealing temperature was 63°C. We expect a PCR product around 300bp. We used the HF buffer of phusion polymerase. 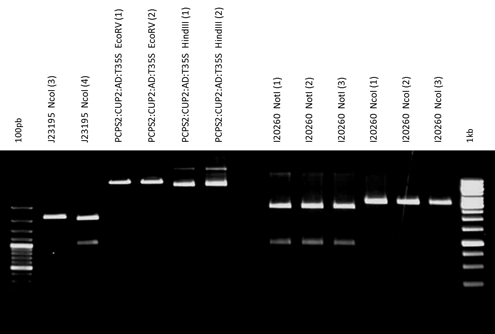 The gel shows that the PCR product is correct. 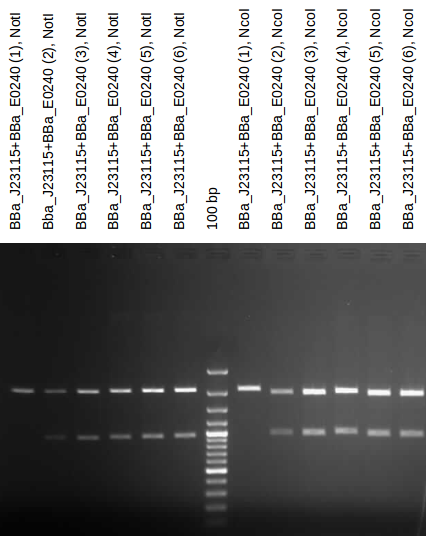 We ligated the insert with vector pSB1A3 using primers named Sept02 y Sept03. We probably had a product in PCR number 7, 8 and 10. We addded 1.2 μL of buffer CutSmart and 0.8 μL of BsaI enzyme in the ligation made yesterday. It was incubated for 1 h at 37°C. Then, it was transformated as usually. Digestions were not correct. We have to repeat them. Additionally, colony PCR made the previous day has also been checked, but even the positive control (checked Barnase) was not present. We tried to digest Barnase ligation with XbaI (the enzyme cuts LacZ region) and then transform it on E. coli, but the electroporation cuvette sparked. Finally, we have received the chromoproteins from Norwich team (safety module collaboration). We digested Barnase ligation with XbaI. Barnase digestions were not correct. We spread the cells in LB plates and we incubate them overnight at 37°C. We did minipreps of yesterday's cultures containing Barnase in pUPD. We addded mutated Barnase as a control. The other ones were not correct. We are going to use mutated barnase. Moflippers containing Ta29, AtrΔ11, HarFAR and EaDAcT. We transformed the ligation into E. coli. Additionally, we picked colonies to store the Barnase in glycerol. 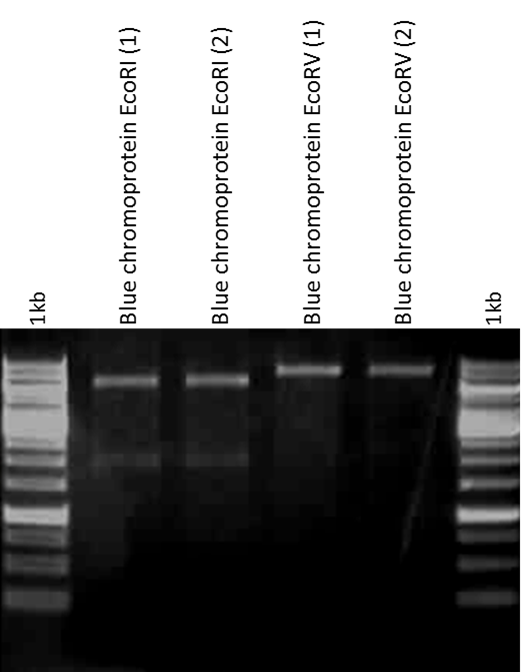 Blue chromoprotein digestions are correct, but only one of the yellow chromoprotein miniprep was correct. Minipreps were correct. We picked cells and recultured it in liquid media to agroinfiltrate them. We did minipreps of yesterday's culture. We ligated both chromoproteins with Barnase TU (Amp resistance) into pSB1A3 vector. We digested them with PstI and EcoRI, incubating at 37°C (40 min) and inactivating the enzymes at 80°C (20 min). After that, we ligated the insert with pSB1C3 vector, incubaating at 16°C (40 min) and inactivating the ligase at 80°C (20 min). We transformed it into E. coli and we grown the resultant cells in LB plates with chloramphenicol. We send the Biosafety module to Norwich. We repeated digestion and ligation into pSB1C3 as previously done. This time we changed the digested vector sample and we used a different T4 ligase. In addition, ligation was incubated 25 min at room temperature instead of 40 min at 25°C. Then, we trasformed the result and we cultured it in LB plates. Colonies containing Biosafety Module did not grown, so we repeated digestion and ligation. Then, we transformed it and we cultured them in chloramphenicol. Agroinfiltred plants with Blue chromoprotein did not show any colour. We leave it one day more. Agroinfiltred plants with Blue chromoprotein did not show any colour, even in the magnifier view. We repeated again digestion and ligation of the biosafety module (Blue and yellow chromoproteins with Barnase)in pSB1C3. 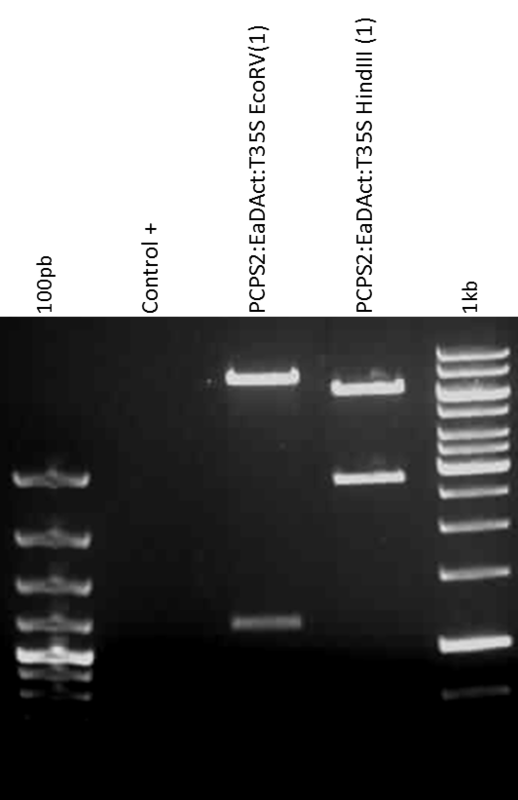 We transformed ligation made yesterday using a TOP10 E. coli strain. We agroinfiltred orthologous genes of Rosea and Delila in Tomato. We want to test other approaches that could be used in place of Blue and Yellow chromoproteins. Yesterday's culture did not grow. We repeated digestion and ligation to pSB1C3 (for Blue and Yellow modules). Then, we transformed it. Plant leaves changed its usual green colour. As a result of anthocyanin accumulation, agroinfiltred leaves were purple coloured. We took photos of transient transformation of the two modules. We transformed BBa_J23101, BBa_E0240 and BBa_J23115. All of the pieces share the vector pSB1C3, so we have cultured them in solid LB medium supplemented with chloramphenicol. Pick colonies and grow them in agitation at 37°C in liquid media supplemented with chloramphenicol. We made minipreps of yesterday's culture, except from BBa_E0240 culture, which has not grown. All digestions were correct except BBa_23101 (1). BBa_E0240 and BBa_I20260 parts were transformed in E. coli DH5-α. BBa_E0240 is resistant to kanamycin and BBa_I20260 to chloramphenicol. Colonies did not grow so plates were left one more day at 37ÂºC. Pick colonies of BBa_E0240 and grow them in agitation at 37°C in liquid media supplemented with kanamycin. Colonies of BBa_I20260 were not grown, so we performed transformation again. Pick colonies of BBa_I2026 grow them in agitation at 37°C in liquid media supplemented with kanamycin. Minipreps and digestions of BBa_E0240. Incubate 30 min at 37°C and 20 min more at 80°C. 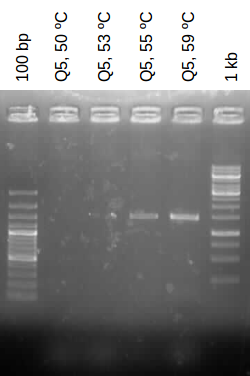 Run digestions in an agarose gel and purify band using QIAEX II Gel Extraction Kit. Incubate 30 min at 16°C and 20 min more at 80°C. Transform both ligations (BBa_J23101+BBa_E0240 and BBa_J23115+BBa_E0240) and grow in solid plates supplemented with chloramphenicol. Colonies did not grow so plates were left one more day at 37°C. Minipreps and digestions of BBa_I2026. There was some kind of trouble with the gel and bands where not clear. We repeat the digestion again other day. Pick colonies of BBa_J23101+BBa_E0240 and BBa_J23115+BBa_E0240 grow them in agitation at 37°C in liquid media supplemented with chloramphenicol. Minipreps of BBa_J23101+BBa_E0240 and BBa_J23115+BBa_E0240 and digestions. Repeat digestions of BBa_I20620. None of the digestions of BBa_J23101+BBa_E0240. Digestions BBa_J23115+BBa_E0240 (1) and (4) were correct and all of the colonies of BBa_I20620 were correct. Pick 5 more colonies of BBa_J23101+BBa_E0240. Minipreps and digestions of 5 more cultures of BBa_J23101+BBa_E0240. BBa_J23101+BBa_E0240 (4) ligation is correct. We noticed that, for some reason, the stry of BBa_J23115+BBa_E0240 was contaminated, so we picked 6 more colonies. Minipreps of BBa_J23115+BBa_E0240 and digestions. All digestions are correct except BBa_J23115+BBa_E0240 (1). 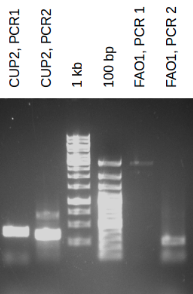 We found out that the stry of BBa_J23101+BBa_E0240 was contaminated as well, so due to the low efficiency of this ligation (1/9) we decided to transform again with the correct miniprep. Pick one colony of BBa_J23101+BBa_E0240. The digestion was correct. We have scheduled the GFP for next Wednesday. Pick colonies for Measurement Interlab Study. Three technical samples for each device and the negative control (untransformed E.coli DH5-α) were picked. E. coli DH5-α cells were grown in 3.5 ml Luria-Bertani broth supplied with the corresponding antibiotic at 37°C with shaking at 250 rpm for 16 hours. Today we measured GFP for the Measurement Interlab Study. Cells were centrifuged at 4500 rpm for 5 minutes and resuspended in ten folds the culture volume with a phosphate buffered saline (58 mM Na2HPO4, 17 mM NaH2PO4, 68 mM NaCl), as performed by Scholz et al., 2000. Na2HPO4 and NaH2PO4 were purchased from Panreac. NaCl was purchased from Fisher Bioreagents. A GloMax-Multi Detection System form Promega fluorometer configured with the Blue optical kit (&Lamda;ex=490 nm, &Lamda;em=510-575 nm) was used to measure fluorescence. For measuring fluorescence 250 Î¼l of each sample were placed in a black 96-well plate. Each sample was measured three times and an average was displayed on the screen. A Biowave CO 8000 from Biochrom spectophotometer was used to measure absorbance at 600 nm. For measuring absorbance 700 Î¼l were placed in a cubet and measured one by one in the spectrophotometer. *Fluorescence measurements were calculated subtracting the average value of fluorescence of three samples of phosphate buffer (286.1) to the value given for each sample by the fluorometer. Ale's primers labeled A11Dic32 and M11Nov12 found. We didn't obtain PCR product. Now there is a band for P35s but it should not be there. We repeated the PCR once more, this time setting the annealing temperatures at (59°C for T35s and 61°C for P35s). We repeated the PCR setting the annealing temperature at 67°C. We are trying another PCR strategy to obtain the PCR product. 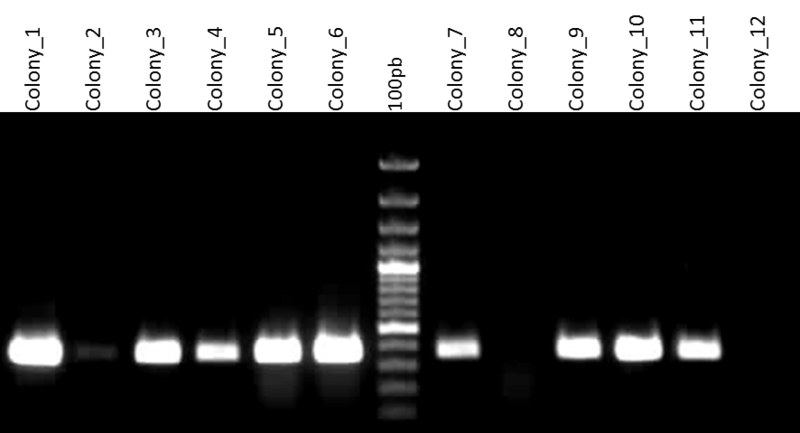 We checked PCR products and only the T35S product was amplified correctly (the expected band was around 300 bp). 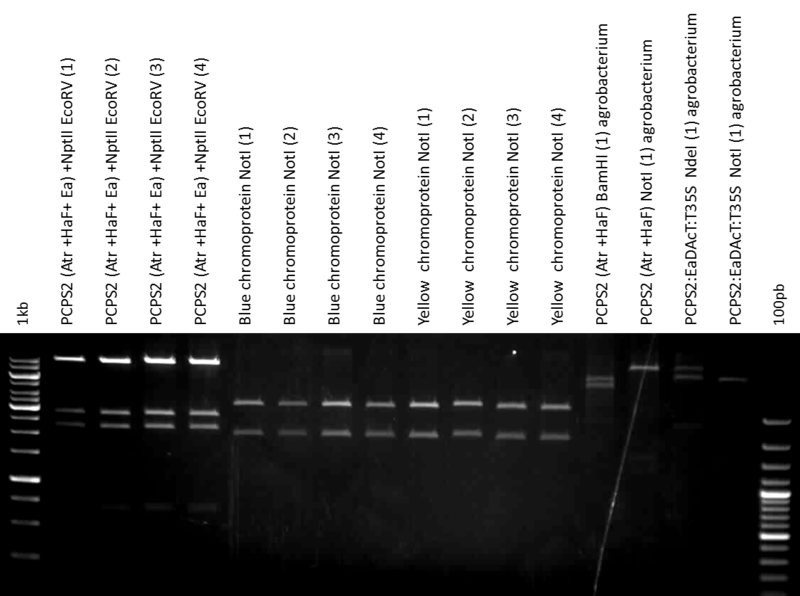 We checked the PCR product running a gel electrophoresis, but the PCR did not work again and the agarose gel did not show any band. T35S in pUPD vector was transformed in E. coli and cultured in agar plates. The protocol followed was the same as it is usually done. We picked E. coli colonies and recultured them in liquid media with the apprpriate antibiotic, Amp (2:1000). We made minipreps of yesterday's culture and we made digestions to check them. We run a PCR with the TUs as templates (adjusted to 5 ng/μL) and using Jul11 and Jul12 as primers. 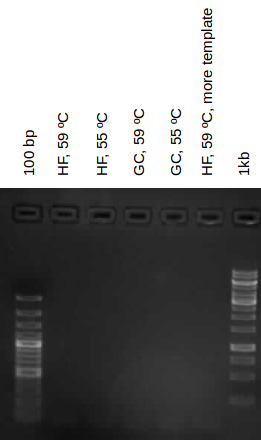 We made another PCR to obtain P35S as a product. This time, we used Q5 High Fidelity polimerase. The gel shows that the template is not there. We repeated the PCR made the previous day using TUs as a template and primers Jul11 and Jul12, but this time we changed the extension time to 1:30 min. 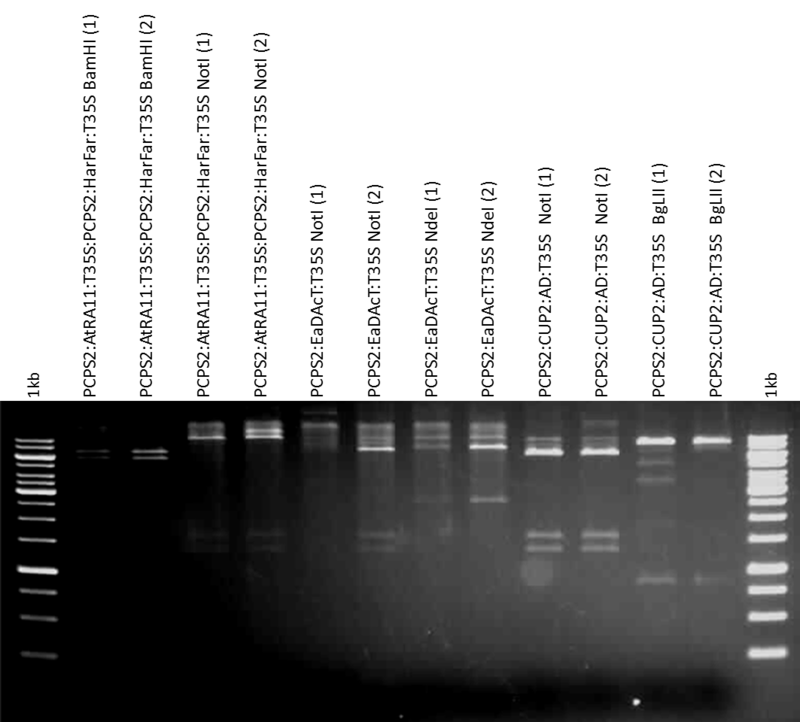 The gel showed that the PCR products were correct. 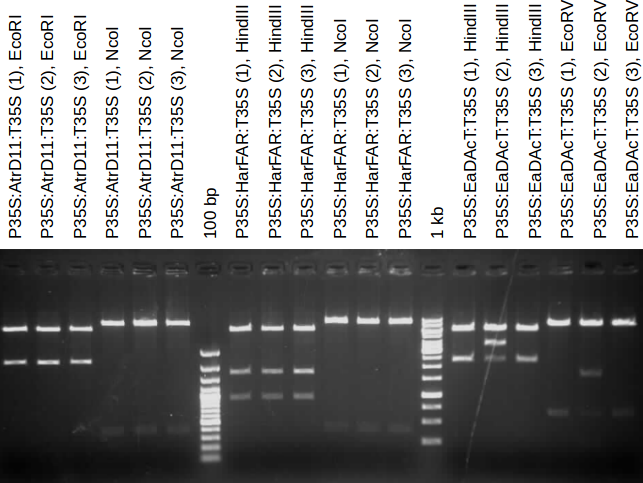 PCR P35S_BB was performed using primers labelled Jul11 (forward) and Ago09(reverse). The annealing temperature was 62°C and the extension time selected was 50s. Other parameters were the same as previously used. We did not obtain any product. We repeated yesterday's PCR, but this time we changed the annealing temperatures, trying 65°C and 72°C. Other parameters were maintained. We repeated the P35S_BB PCR, but this time we changed the annealing temperature to 65°C. We did not obtain any PCR product. We purified the band in order to obtain vector pSB1A3. Digestions were not correct. We have to repeat them, so we picked other colonies. MoFlipper cultures did not grow. DraI does not cut well, but Ω undercover seems to be okay. Nevertheless we repeated the digestions. We digested BBa_J23115 with EcoRI and PstI to obtain pSB1C3 vector. Then, we purified the band. We ligated Yellow and Blue TUs to the Ω undercover vector. We transformed them into E. coli and we grown the culture in LB agar plates. We had the genome of S. cerevisiae, needed to extract the target genes that are going to be used to build the switch. However we finally used our genome extraction (see Biosynthesis part, date 07/23/2014 for further details). 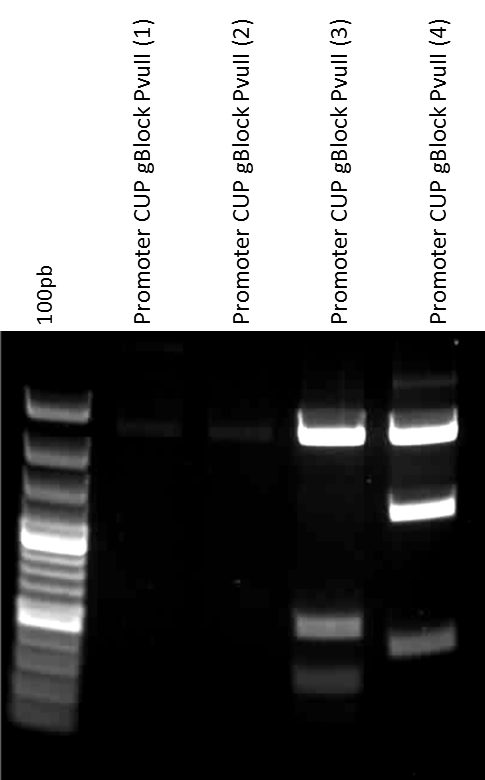 Previously we have designed a cupple of primers to amplify the CUP1 and CUP2 genes present in the yeast. 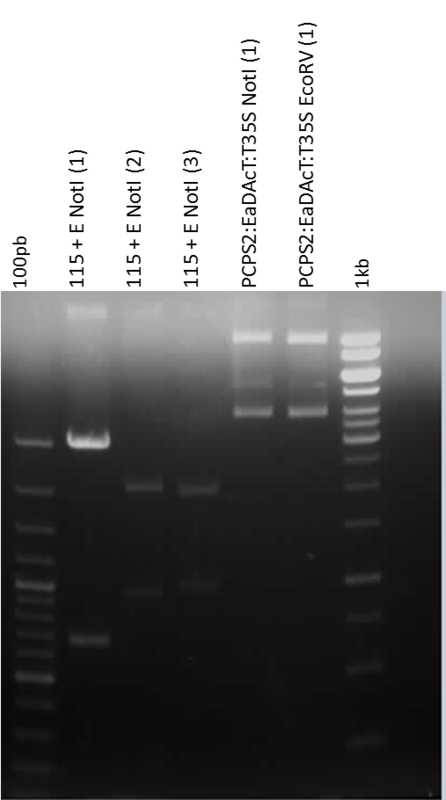 Both PCR products were correct. 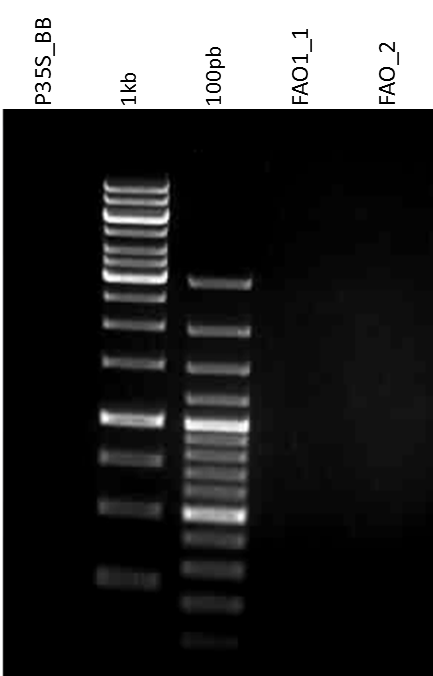 We repeated the PCR because we had to purify the bands CUP1-PCR1 and CUP2-PCR2.For this purpose we used the kit "QIAEX II Gel Extraction Kit". Ligation of both parts of CUP2. CUP2 was transformed in pUPD and cultured in solid media (37°C). Grow the piece corresponding to Gal4 Activation Domain (GB0095) from the GB collection in solid medium. Pick colonies from CUP2 (3 colonies) and Gal4AD (1 colony). CUP2 in pUPD is correct. 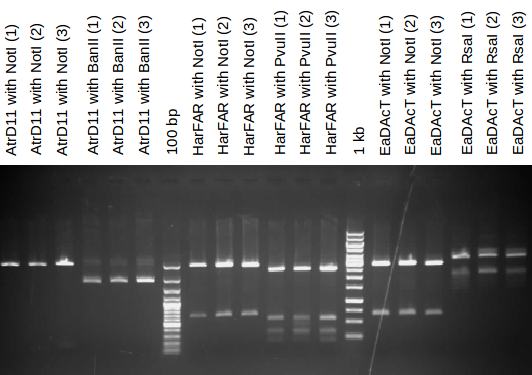 RsaI restriction enzyme does not cut properly, as a result we obtained different bands from those ones expected. Sequencing results of CUP2 piece were finally received and they were correct. As the sequence was correct, we could continue with ligations. Samples were diluted to 75 ng/μL. E. Coli transformation with the previous ligations and culture in solid medium (LB-agar with Kanamycin and X-Gal + IPTG) overnight. We recultured yesterday's colonies in liquid media with the same antibiotic (Kan) and X-Gal. Minipreps of yesterday's culture and streakes were made. 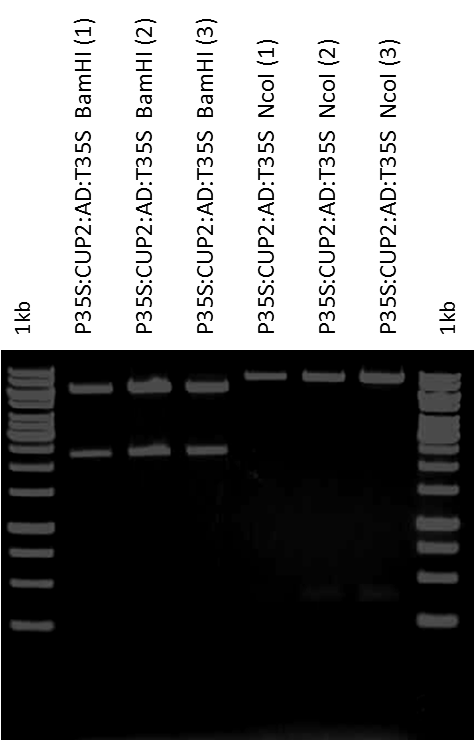 The agarose gel shows that P35S:CUP2:Gal4AD:T35S piece is not well build. 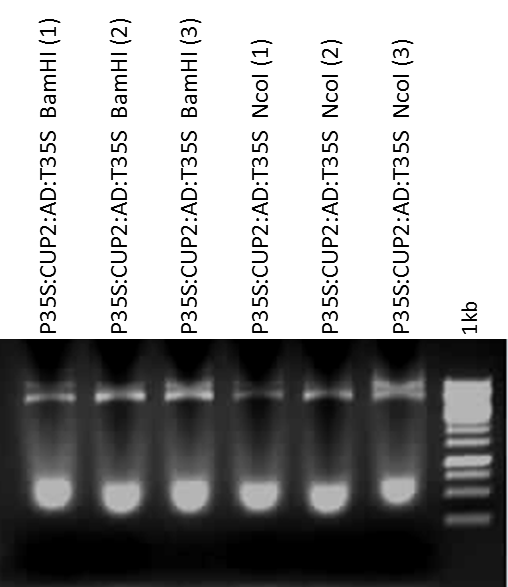 Nevertheless, PCPS2:CUP2:Gal4AD:T35S piece is OK.
After running the electrophoresis, the resulting bands show that there is something more than expected in the plasmid. Furthermore, we check that the extra part has been added in the part region. Ligation step has to be repeated. We repeated the P35S:CUP2:Gal4AD:T35S ligation. TU piece was transformed in E. coli (P35S:CUP2:Gal4AD:T35S) and cultured in solid media. E. coli colonies containing the TU (P35S:CUP2:Gal4AD:T35S in 2α2) were recultured in liquid media. Protocol was the same as previously folowed. We picked CUP2 in pUPD colonies and recultured them in liquid media in order to preservate them with glycerol. The other TU has not grown, that is why we repeated the transformation as yesterday was done. We stored CUP2 in pUPD liquid media with glycerol. We made minipreps of PCPS2:CUP2:Gal4AD:T35S in 2α1. We have to repeat digestions. We repeated P35S:CUP2:Gal4AD:T35S in 2Ω1 ligation since previous cultures were blue colored. We transformed into E. coli ligation made yesterday and cells were cultured in agar plates. P35S:CUP2:Gal4AD:T35S in 2Ω1 ligation was repeated, since we did not found any white colony in the agar plates. Conditions were the same as we did previously. We transformed it in E. coli and we recultured the cells in agar plates. We consider to use the miniprep number 2. Digestions were not correct, we made a mistake and we have to repeat them tomorrow. We picked colonies again. We did minipreps of yesterday's culture and we repeated digestions. We transformed the SF_P35S:CUP2:Gal4AD:T35S in 2Ω2 into A. tumefaciens. LB agar plates were stored at 28°C during 2 days. We had very low DNA content in GB253 miniprep so we recultured it in new liquid media to repeat the miniprep again. We obtained low DNA content in GB0253 miniprep, but it was correct. We finally received the GBlock containing the chimerical promoter: UAS sequence + (-60)mini35S. We picked clonies containing GBlock in pUPD in order to store them in glycerol. We did minipreps of yesterday's culture containing the GBlock in pUPD. Digestions have to be repeated. We picked colonies 3 and 12 to make the miniprep. Tomorrow we will transform the result. We transformed yesterday's ligation in 2α1 into E. coli DH5α cells and the result was cultured in LB Kan-IPTG-XGal plates. Addtionally, we ligated the binary assembly: CUP2 with Renilla into the 2α2 vector. P35s:CUP2:T35s_P35s:Ren:TNos_P35s:P19:Tnos digestions were not correct. If we look at the band size, colony number 1 could be P35S:Ren_P35S:P19 without CUP2 TU. 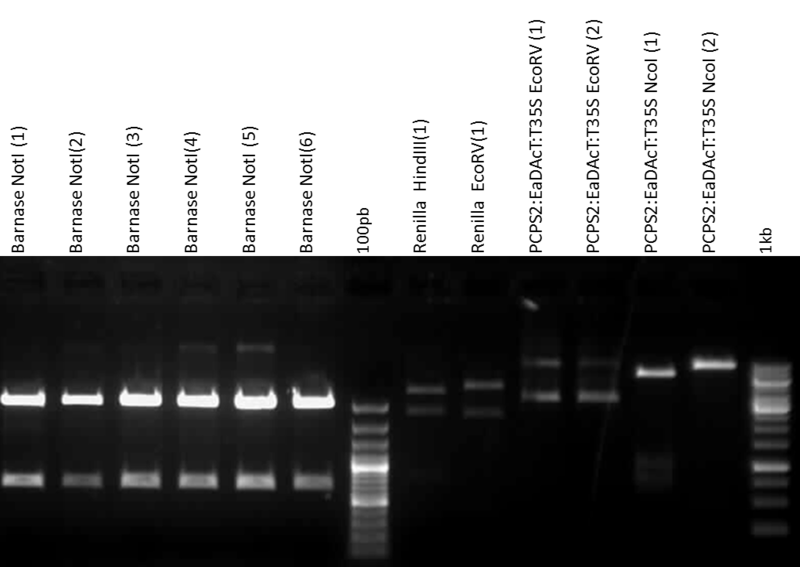 We changed the strategy, we have the Luciferase TU and another Renilla + P19 in 2α2, so we made the following ligation. We made the following binary assembly. We transformated colony 1 on A. tumefaciens. We picked A. tumefaciens colonies with P35S:CUP2:T35S in 2Ω1. We picked A. tumefaciens colonies transformated the previous day.